This page showcases the activities of the DRSA's volunteers. It supercedes the various departmental pages which were linked to the Activities section. The old pages can still be viewed (C&W, Lineside, Station Maintenance, Traction Group) but are no longer being updated. Can I please remind volunteers, especially team leaders, that this page relies heavily on your contributions. 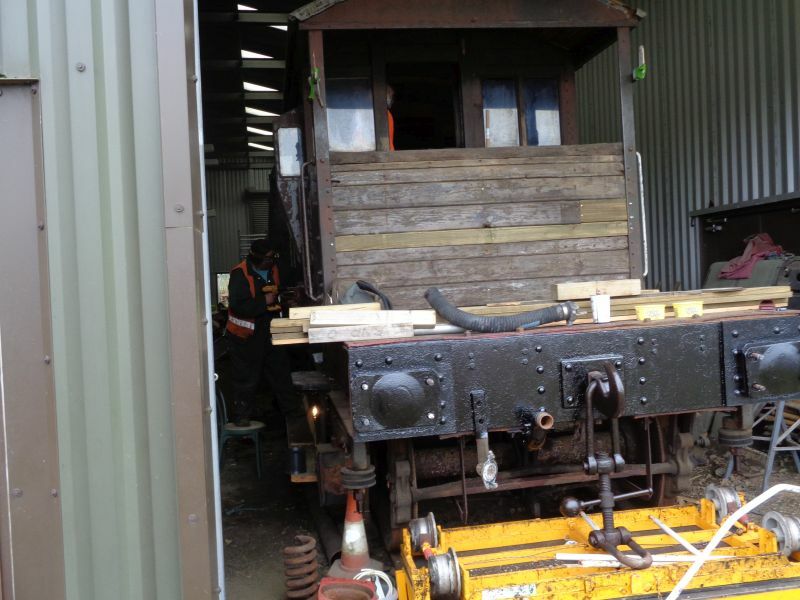 Note that there is also coverage of the early stages of the restoration of brakevan LDS55625 on its dedicated page. Carriage and Wagon reports are by David Bell unless otherwise stated. Thanks to all our contributors. 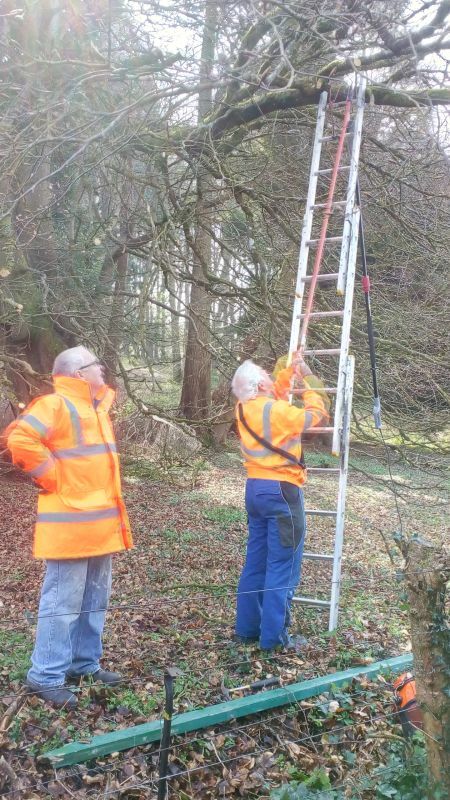 The SMT has purchased a pole saw for dealing with problem vegetation like the branches which overhang the GUV. The day's main activity was a training session in which we learned how to get the saw stuck up a tree. We eventually got it back down again, after a lot of mucking about with ladders, ropes and a long handled pruning saw. Damage was confined to credibility. Elsewhere there was a bit of seat painting and museum wall plastering, but the team was rather small. It was nice to watch a sensible train on heritage services after the extravaganza of the previous weekend. It was also good to see Richard Westlake out and about again after his recent health issues. 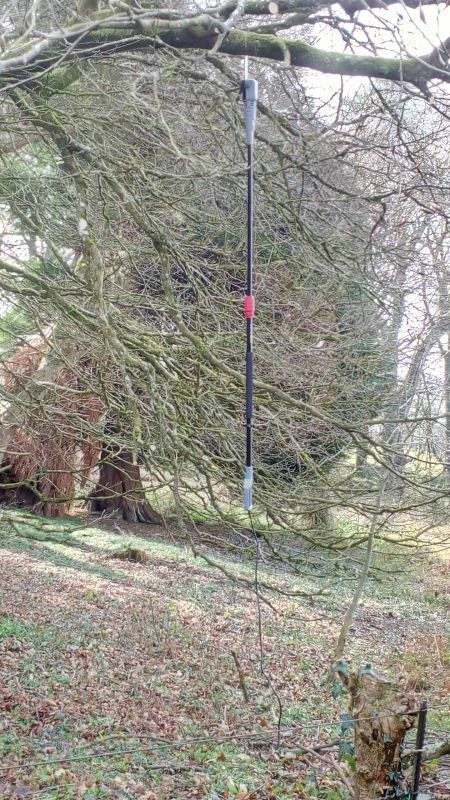 The station maintenance team's nice new pole saw stuck up a tree. The team recovering the pole saw. A beautiful warm day greeted the 10 C&W volunteers at Meldon today. Unfortunately Geoff Horner could not be with us as he was in hospital having tests; we wish him well and a speedy recovery. [Geoff is OK and was home by Sunday, we're pleased to announce]. A problem starting the LAB11 generator, after being topped up with the remaining stored fuel, led to the discovery of a significant quantity of water condensate in the fuel system. This was revealed after time consuming tests at various points. After the water was drained from the feed pipes and main fuel tank all was well. Meanwhile a new partial topcoat was applied in warm sunlight to the South side of FK S13436 which had been vandalised with graffiti late last year. The coach was also given an internal spring clean and one double glazed window removed in order to rid it of serious internal condensation. This was done, as in the past, by converting and resealing it back into the frame as a single glazed unit; a simple cost effective expedient! As part of the Heritage Set FK S13436 will be moved to the station next week in readiness for the start of the summer season's trains. Work on carriage doors, drop windows and the buffet coach continued whilst a team carried on with resurrecting brake van LDS55625. De-rusting the steel running board brackets on the South side was completed and special primer applied. More woodworking on the Eastern veranda continued, whilst undercoat was applied to all the carriage door trims on the South side of the Thumper 1132 motor unit. Phil Hull grinds rust off the last of the brackets. Phil admires the partially finished product. Nigel Green rubbing down the undercoat on the internal door trims on Thumper 1132. Patrick Doyle screwing down floor boards in the Eastern veranda of brake van LDS55625. John Davis assisting Patrick, providing him with whatever he needs, including advice! A warm dry day on which a team, led by John Coxon, set out for the Buffet car 69310 in the viaduct visitor's area. A lot of awkward grubbing about underneath was required to get the water and plumbing back in order and either to fix or identify various other unrelated problems discovered during the process; some remaining to be sorted out. Meanwhile another team worked on the LMS brake van 731411 repairing the veranda safety doors, ready for it to go back into service on the heritage train at the end of the month. The remainder of the C&W volunteers worked on the brake van LDS55625 chipping and priming external metalwork and stripping old interior paintwork. [David said there wasn't anything riveting to photograph, which was handy as he'd forgotten his camera]. A high, cold wind and driving rain did not deter a full turnout (11) of C&W volunteers. Work started on undercoating the South side of the Thumper power unit 1132 and the replacement internal surface wood work was completed on the guard's compartment door. 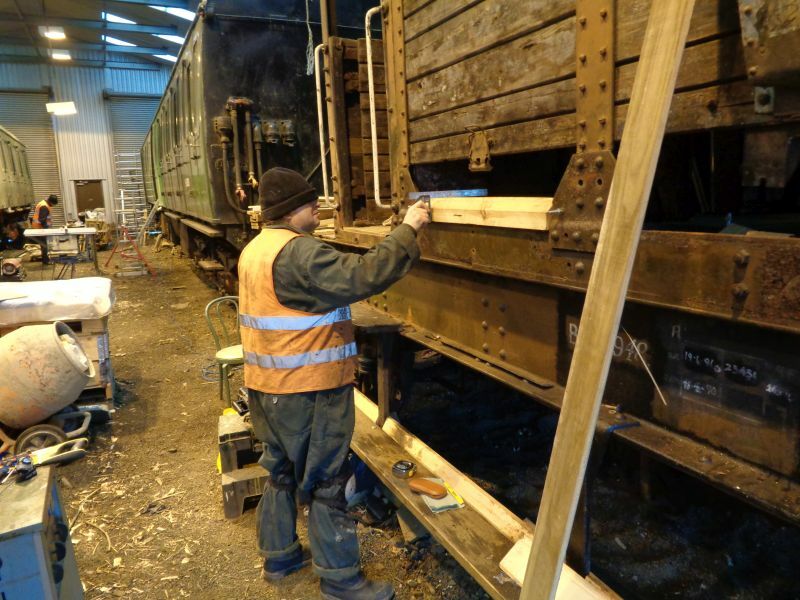 Meanwhile a team set to, on the SR brake van 55625, removing corrosion on external steelwork on the South side, internal paintwork removal in the cabin area and renewing external cladding on the North side. Our painting machine Alan Harris (wearing ear defenders) yet again found a warm but noisy place of work, this time in the generator compartment aboard LAB 11; sprucing up the interior paintwork. Nigel Green, John Coxon on stage and Terry Bridgeman in the background apply undercoat/primer to the Thumper 1132 power car. Paint rollers are used for the large flat surfaces, whilst brushes are used to pick out frames and edging. The replacement woodwork on the Thumper guard's compartment door has been completed by Ron Kirby and the locking mechanism refitted. It now remains to be seen if the door fits back in place - before finishing it off! 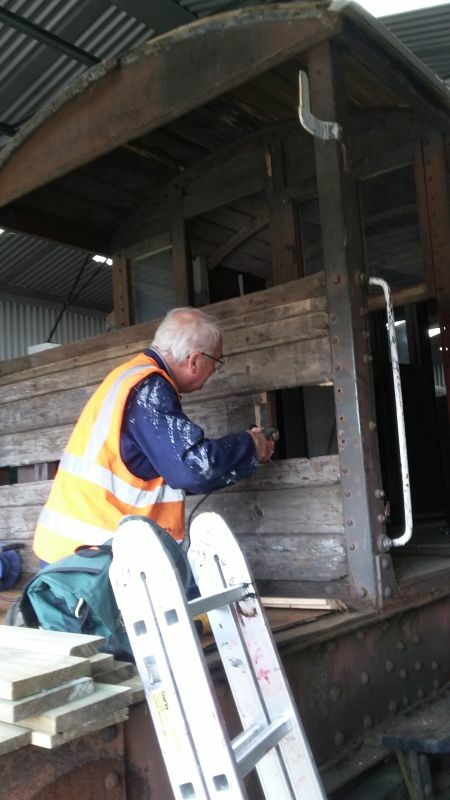 Geoff Horner, using an electric wire brush, below a stack of off-cuts and the few remaining planks left for refurbishing the brake van. (Other builder's merchants are available). 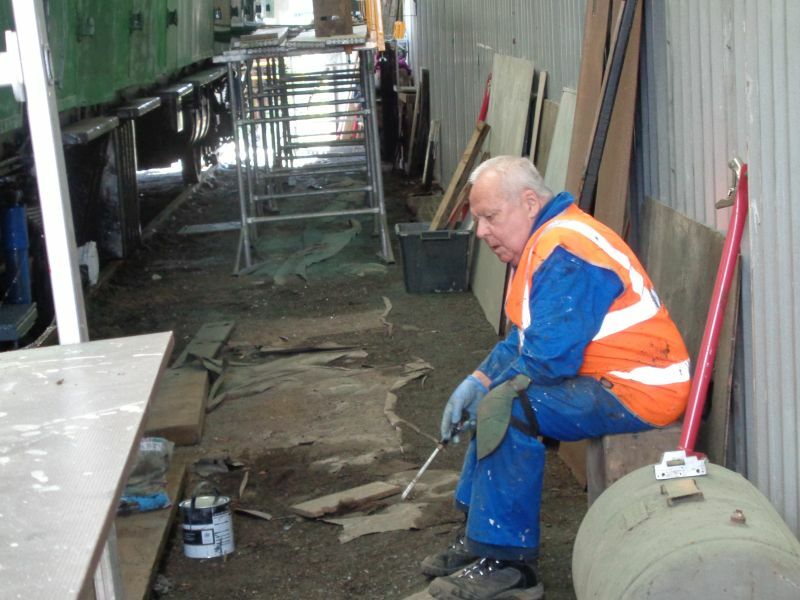 John Davis scraping off old paint on the Eastern veranda of the brake van. The screech of the flat bed saw continued unabated all day. 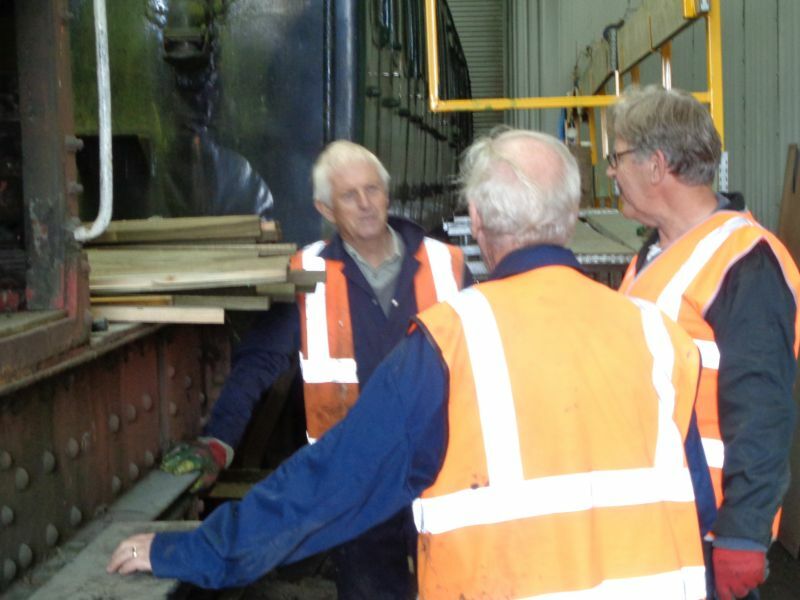 Despite heavy rain a group of DRSA C&W volunteers visited the Bodmin & Wenford Railway. We were greeted and shown around work in progress in the engine shed and workshop by various cheerful and enthusiastic volunteer staff; of whom some had a long history of volunteering on other heritage railways. The scale of the work and the facilities available were most impressive; resulting in an enjoyable day out meeting like minded, enthusiastic supporters. On our departure we were waylaid for a chat amongst the puddles, by Jimmy James (far left), a volunteer and editor of the Bodmin & Wenford Railway Magazine. A day of showers confined the C&W team indoors. Work continued sanding and preparing the North side of the Thumper 1132 power car for painting as well as repairing the wood work of the inner shell and locking mechanism of the guard's compartment door. The seemingly endless woodwork replacement, together with paint, gunge and rust removal, continued on the SR brake van 55625. However, the odd splash of new paint appearing here and there, albeit grey and red oxide primers, are positive signs of progress. Geoff Horner, feet resting on the stove-pipe, chips away at the heavy corrosion on the running board brackets. It is not as comfortable as it appears! Phil Hull has fashioned and painted the replacement boards. The originals had rotted away almost completely on this side. Ron Kirby at work on the guard's compartment door. Meanwhile Thumper 1132 power car on the right awaits a lick of undercoat. Ron cleaning up the door locking bar, regretting that he forgot to photograph the door before dismantling various parts! A warm, dry day made life easier for the C&W group and some outdoor tasks were accomplished. 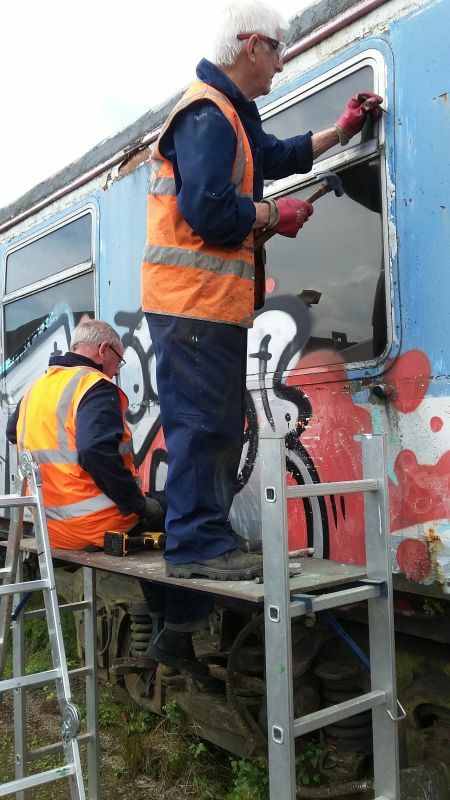 Firstly, a team tackled the repair of the damaged paintwork on carriage FK S13436 caused by the graffiti and subsequent removal. Back in the workshop sanding down the Thumper 1132 power car continued, whilst on brake van 55625 paint stripping using the heat gun was carried out on the veranda area woodwork at the West end and hand rails on the North side. Rust removal and a coat of primer on the East end buffers was completed. Finally, more external timber replacement cladding was fashioned ready to be fitted to the North side. A beautiful day greeted a smaller than usual C&W team at Meldon. LAB11 was so warm inside at 10 a.m. that there was no need to start the generator and switch on the heaters for our initial coffee session. By lunchtime it was even warmer in the saloon and the generator was run down to conserve fuel! 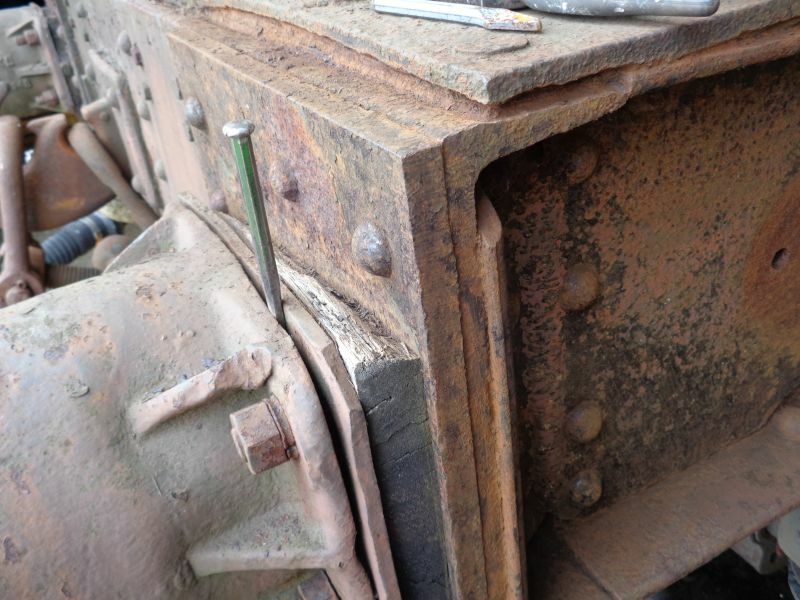 A trio attacked the sanding down task on the North side of the Thumper 1132 driving trailer whilst work continued on the repair of the guard's compartment door. The replacement skin has been fitted, together with the handles, hinges and grab bars; making a vast improvement so far. Meanwhile Alan Harris basked in the sunshine, perched on a ladder, fitting CCTV security cameras. Old paint, grime and rust has been removed from the brake van buffers at the East end and a first coat of primer applied. Alan Harris in the warm sunshine fixing the CCTV camera warning signs. How many DRSA volunteers does it take to clear sawdust from under a flat bed saw? SMT today had a minimal presence. In fact only one attendee up until midday. A slightly unfortunate start with a 'warranty claim' from last week. Despite best efforts last weekend the Gents Urinal Cistern contrived to spring a leak in the joint between the bottom of the cistern and the existing pipework. A colleague's valiant attempt during the week with some sealant he had available failed as it turned out to be water soluble! It did however result in an attractive white trail down the wall and puddle on the floor. So first job was to attempt an alternative. A lot of Plumber's Putty plus considerable tightening of the joint later appeared to have the desired leak tight effect. Until next week maybe? Paul Vodden arrived midday and progress stepped up a gear with work proceeding rapidly on manufacture of the new protection boards for Bridge 609. Interesting discoveries during the work were that the Victorians who manufactured the bridge had a variable approach to their measurements. The space between the stanchion uprights all being slightly different. So a certain amount of extra cutting and fitting was needed and also to clear the rivet heads, the bridge being of riveted construction. However in defiance of Victorian values we will be using smart zinc plated metric sized coach bolts to secure the new boards. Paul Vodden at work on the new protections boards for bridge 609. This image gives a clear idea of the function of the protection boards. A bright cold day greeted a full turnout of the C&W team (11 members). Therefore, with a pool of ingenuity and muscle to hand, we had no excuse for delaying refitting the buffers onto the SR brake van 55625. This task was accomplished within about an hour, without cuts and bruises, leaving your correspondent to remove the rust, grease and old paint on them; then paint them in due course. Meanwhile, painting, woodworking and scraping continued elsewhere on the van both internally and externally. Work continued on internal painting and sanding down on the Thumper 1132 driving trailer, including repairs to the Guard's compartment door. Regretfully just after lunch we were advised to cease work and clear our cars from the site as there was a possibility that we would be blocked from leaving. A coach from the visiting rail grinding set was being loaded onto a road trailer and it was feared that the vehicle might become bogged down during the manoeuvring process involved. The team prepare for the heavy lift. The buffer had to be lifted and rested on built up supports in stages due to the weight and risk of slipping. "Right", said Fred. 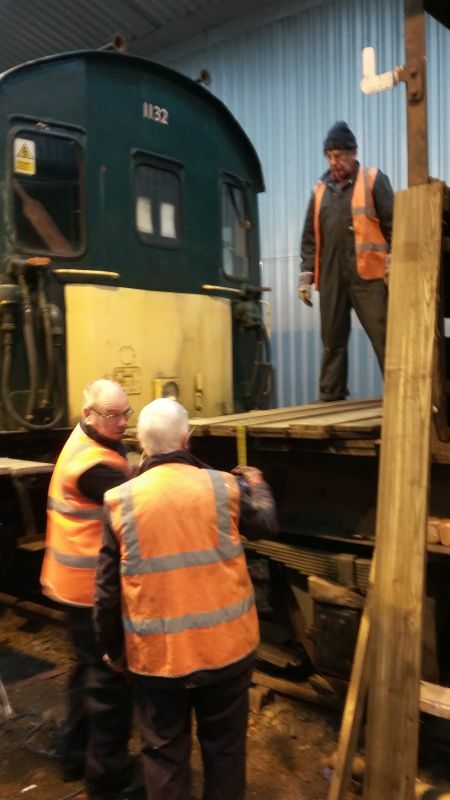 "With a heave or two ..." - John Coxon and Terry Bridgeman guide the buffer onto the retaining bolts whilst Ron Kirby lifts the supporting ladder. Buffer aligned by John and Terry whilst Phil Hull stands in the background looking intrigued (impressed perhaps?). Your correspondent tightens up the bolts whilst the others prepare the other buffer for lifting. Geoff Horner gives Ron Kirby a welcome hand on lifting whilst John Coxon and Terry Bridgeman fit the buffer on. Final tightening of the nuts. Job done! Geoff Horner muses whilst Terry Bridgeman checks the retaining nuts. 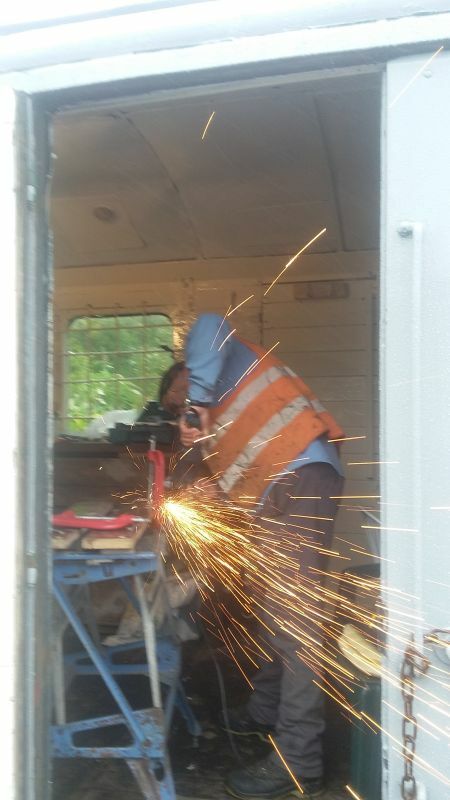 Ron Kirby discusses the next step with John Coxon, having cut the replacement outer skin for the the Guard's door to shape with the angle grinder. 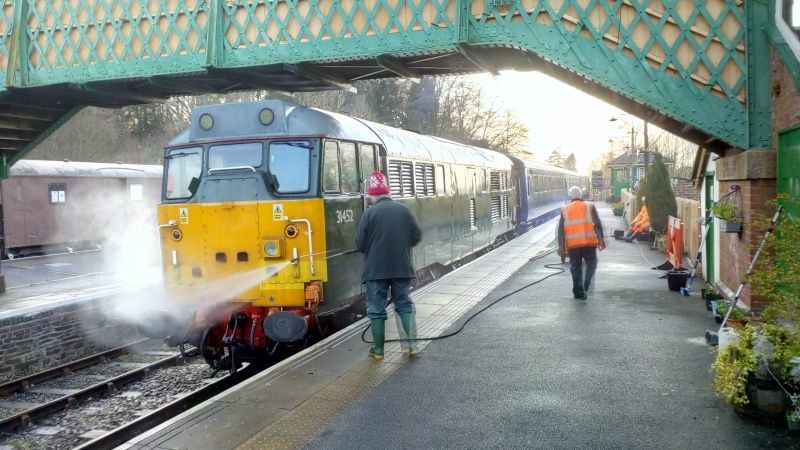 With David Bell producing weekly, well illustrated C&W volunteer reports, coverage of the Station Maintenance 'action' looks a bit threadbare in comparison. In our defence, the SMT tasks aren't as photogenic as the C&W ones, and I can confirm from bitter experience that not all of them set the pulse racing. The highlight of last Saturday was the replacement of the urinal cistern in the gents bog. I'm not making this up. In a commendable attempt to save water, someone had put railway ballast in the old one, and it broke. John Coxon and Tom Baxter fitted a new one. Eat your heart out, NRM. We also moved all the sack trucks, trolleys and planters back into position on the station, from their winter refuge out of reach of the festivities. How many other preserved railways do that every year? John Caesar did some stuff in the museum, John Coxon wallpapered D4167's cab, and the website editor did yet another bodge on the same rotten wooden gate. The previous week Paul Vodden was the only one to do any work. 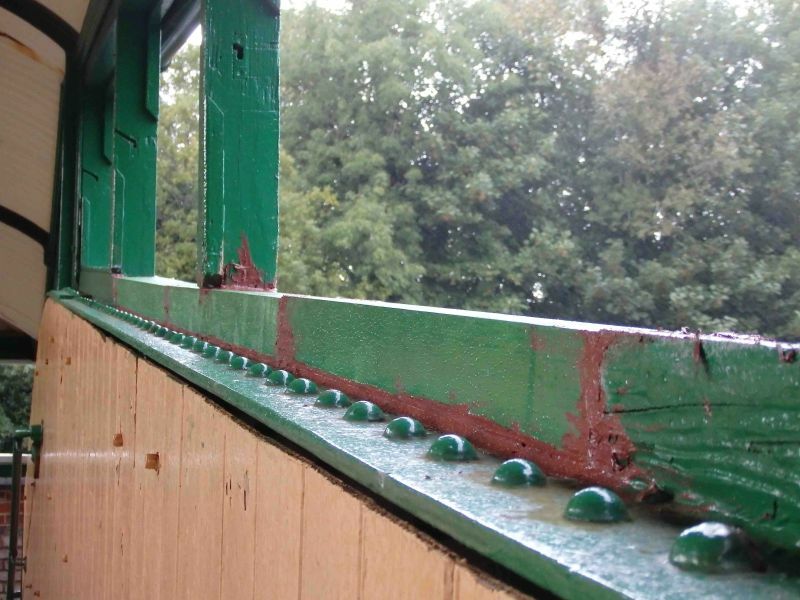 The timber panelling which augments the railings on bridge 609 was rotten and damaged, a potential hazard. Paul stripped it off and cleaned up the area ready for new replacement. The job would have been easier if DRSA still had a hacksaw. Paul Vodden preparing to fit new timber to bridge 609. It will reduce the large gap between the bridge girder and the lowest railing. A bright cold day to start with. 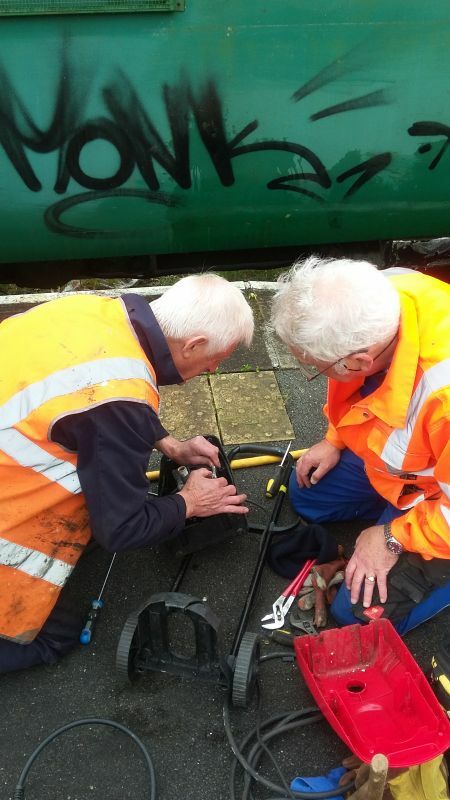 While the sun shone the remains of the graffiti on FK S13436 were removed, whilst a replacement electric heater was mounted, rewired and tested (to the satisfaction of the C&W luncheon club members), in the saloon of LAB11 later. An identical model that it replaced lasted only one year. Meanwhile work continued on the Thumper 1132 driving trailer sanding down on the South side, applying undercoat on the North side and grey topcoat in the guard's compartment. A plywood under inner skin has been fitted to the detached Guard's door and an outer skin of aluminium fashioned ready for fitting. Work continued on paint and rust removal on SR brakevan 55625 whilst oxide primer was applied to some of the internal veranda ironwork framing. 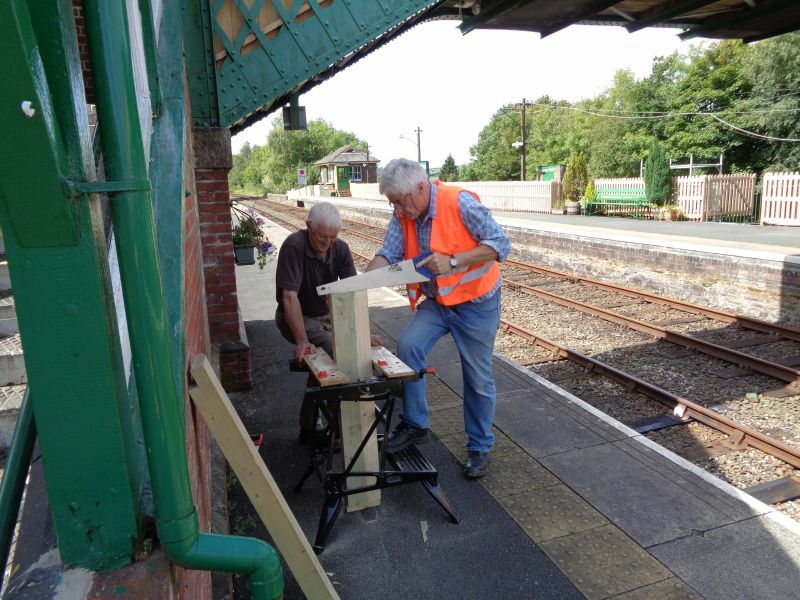 With the use of planks, C&W ingenuity, brute strength and a portable work bench it is planned to remount the two buffers next week. With aid of a special thinners Ron Kirby and John Coxon scrub off graffiti in the sunlight - the latter soon disappeared as forecast! Ron Kirby sanding the plywood skin the guard's door. The aluminium cladding lying nearby having been tried for a good fit. 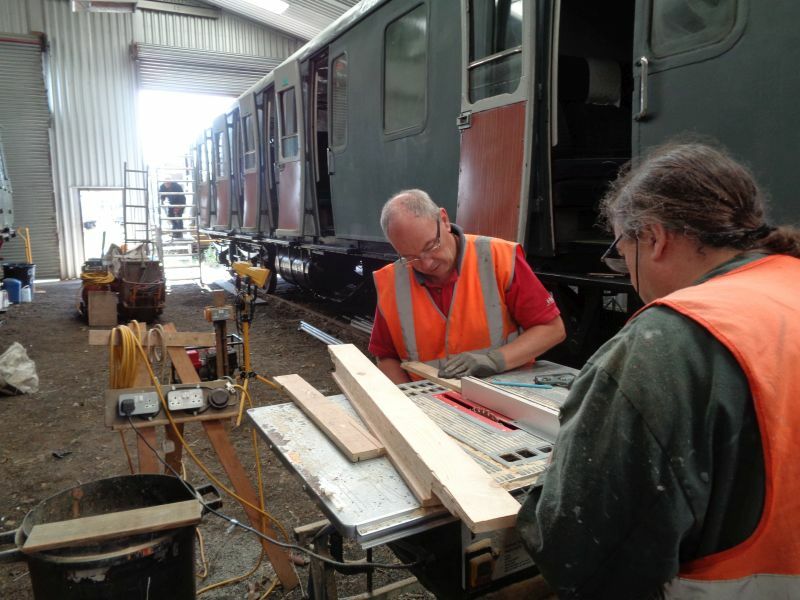 John Davis using a heat gun and scraper on the handrails of the brake van, whilst in the background Nigel Green applies grey undercoat to the thumper. Patrick Doyle basks in the warm glare of floodlights while applying red oxide primer. Patrick Doyle displays a patch of scraped metal on LDS 55625. A fine cold frosty day greeted the C&W team at Meldon. However, a warm Lab11, hot coffee and a round of kindly donated mince pies set the scene first thing on arrival and we were all relieved to see that no further graffiti had appeared on rolling stock over the Christmas break. Work was concentrated on the Thumper 1132 driving trailer. Alan Harris, the C&W painting machine, spent the day in the warm confines of the guard's compartment dispensing a copious quantity of light grey gloss, whilst others sanded down external panelling along both sides. Initially Ron Kirby continued with the repair of the guard's compartment door and then helped out with woodworking elsewhere. 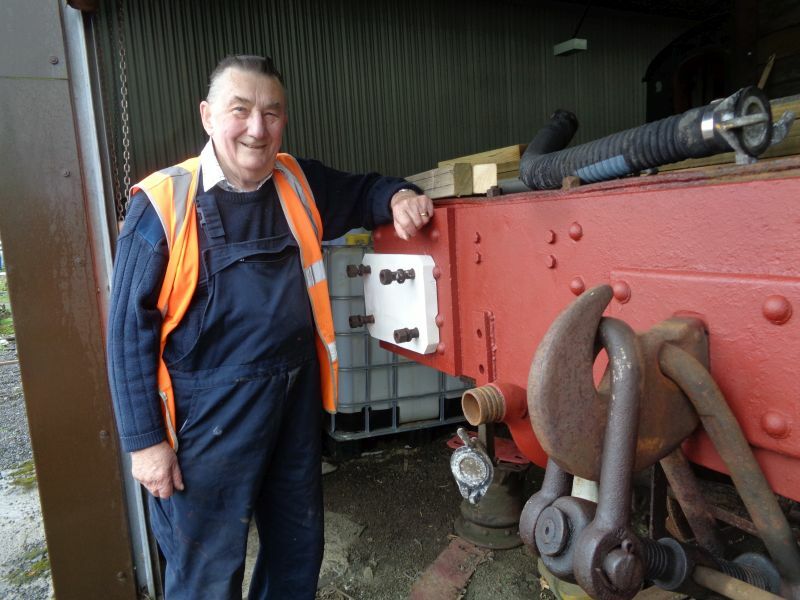 The remaining members worked on the SR brakevan 55625 preparing and fitting side panelling, priming recently de-corroded metalwork, whilst Phil Hull gave the long running board on the North side a first topcoat before it is refitted; finishing off with a couple of odd jobs here and there. Nigel Green on the South side of the Thumper working bottom upwards with a sander. A camera-shy John Coxon caught whilst concentrating on sanding down the North side of 1132. Alan Harris painting in the warm comfort provided by the floodlight. His hand moves so fast it's just a blur. Rebating a drip sill for the SR brake van 55625 by hand. More woodworking activity. Not quite sure what Phil Hull was doing! 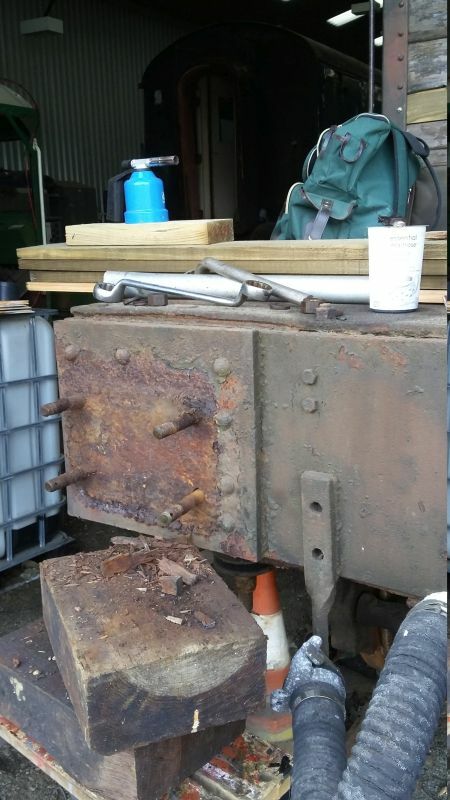 North side of the brake van with freshly primed running board supports which were originally heavily corroded. John Coxon sanding in the background whilst enveloped in a cloud of dust. Threads on the brake van buffer retaining bolts being cleaned out then oiled. Strong winds and rain met the team at Meldon today. A first task was to try and remove yet more mindless graffiti on both sides of FK S13436 before it dried hard. Work on the Thumper 1132 motor trailer 60150 continued, sanding the North side and working on the badly corroded door of the Guard's compartment, which has been removed onto a work bench. Replacement of the cladding to the South side of the SR brake van 55625 was started, whilst more rust chipping and paint removal continued on the underframe on the North side. In addition the steel plates to be used on the spacer for the buffer with the broken spring were cut out. Work started immediately on the Thumper 1132 power car. Loose and flaking paint on the roof has been removed and repainting begun. One guard's compartment door is in a sorry state and work has started to see what can be done. Meanwhile work continued on the SR brake van 55625. The running board on the north side has been renewed completely and received a first coat of paint before re-fitting. The cabin door at the west end is in the process of being repaired and re-hung. More removal of flaking paint was carried out in veranda roof spaces; tiring work using a heavy cumbersome power driven wire brush. The workshop space heater was overhauled and the fuel injection system cleaned out. A vital periodic task if the machine isn't to become a flame thrower! The existing power connection between LAB11 and Mk2 FK S13436 is substandard and work to replace the electrical power take-off couplings and cable is in hand. The same applies to the electrical connection on LAB11 used to feed the workshop, which is currently a maximum rating of 13Amps and will be upgraded to 32Amps. This will obviate the need for 2 separate cables to supply the workshop and overhead lighting. Almost 100% C&W turnout on a fine Autumn day at Meldon. We were pleased to find LAB11 shunted 'expertly' into position outside the workshop (by trainee Class 08 driver John Coxon) - and the power car of Thumper 1132 parked inside the workshop, ready for its overwinter refresh. The LAB11 generator was started immediately with the intention of warming it up, prior to a long overdue oil and filter change later in the day, which was completed without any problems. Being a fine day, we were able to complete a few unfinished external painting jobs on the Thumper driving unit. Internal woodwork replacement on the SR brakevan 55625 continued and the headstock is ready to have the buffers re-fitted next week; subject to available muscle power! Meanwhile a start was made on removing the old damper on one of the suspension springs. This is proving difficult as it was discovered that the locking nut on all eight dampers had been locked to the thread on the spindle with a small weld. The headstock of the SR brakevan ready for the buffers to be fitted. More rusted-in bolts being drilled out in the background. John Coxon, Terry Bridgeman (belated welcome to DRSA/C&W Terry!) and Geoff Horner in earnest discussion regarding the best way to remove welded lock-nuts. A lighter moment as John Coxon hides from the camera - much to the amusement of Terry. The pre-Christmas shunt took place on October 19th, and the two Thumper 1132 carriages were swapped out and in to the shed. Geoff Horner took some photos of the action to bring members up to date on progress on the Thumper. The freshly painted Thumper 1132 driving trailer emerging from the workshop. The newly painted Thumper 1132 driving trailer in the sunshine in the Meldon yard. The three Thumper cars: left to right, the un-worked on power car, the unused centre car and the newly repainted driving trailer. 3 shades of green! The power car going in to the shed to become the next C&W project. The lighter green patches were applied to hide a recent graffiti attack. The Thumper power car in the Meldon shed. A fine cold day, but a chilly wind greeted the C&W workers today. As the summer shuttle service has finished we were told that the DRSA owned Heritage stock would be moved up to winter quarters at Meldon this week and, in addition, that the power car of Thumper 1132 would be brought up for an overwinter refurbish; work on the driving unit being complete apart from a few odd jobs. Morale rose with the prospect of a warm mess room in the form of LAB11 and the powerful on-board generator to run the workshop lighting and more power tools at the same time. Work continued all day on the SR brakevan 55625, with a minor diversion of labour to repair the roll-up door damaged by last week's high winds. Jon Coxon and Ron Kirby attempt to release the screw coupling between the Thumper and brake van with the aid of copious squirts of WD40. Meanwhile Alan Harris applies a few colourful touches of paint to the braking system. Alan Harris takes a break from painting and 'supervises' John Coxon tidying up a Thumper compartment. C&W versus the elements. Ron Kirby fixing the door with even larger screws! Geoff Horner holding ladder whilst supervising. A team of 10 C&W volunteers braved Autumnal rain and wind today. Work on rubbing down the first topcoat on the Thumper and applying the second coat continued apace and it is satisfying to see it looking very smart once again. 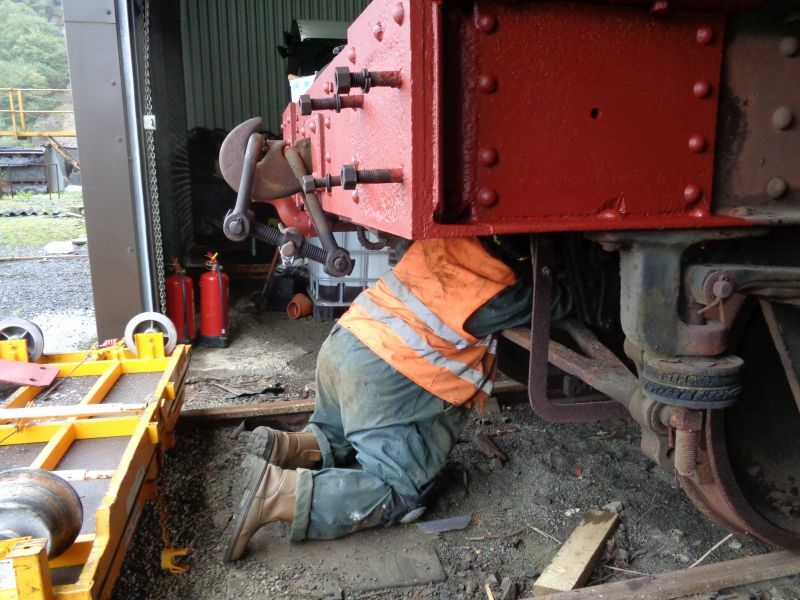 The remainder of the team worked both on the inside and outside of the SR brake van. The stack of timber planks shown earlier has now diminished considerably. Thanks to the kind donation, by DRSA Committee member Tony Hill of a 1.25 inch thick plank of finest Devonshire oak, the two plates for the buffer beam have been fashioned for a perfect fit. Working on oak made a satisfying and pleasant change from pine. Grinding out yet another 70 year old rusted-in bolt on the brake van. Ron Kirby rubbing down the first topcoat on the Thumper whilst, in the far background, Nigel Green prepares a paint roller for the final topcoat. (The chair in the picture was replaced, shortly after the photo was taken, with a pair of newly purchased steps). Your correspondent proudly displays one of the pair of oak plates now fitted on the brake van headstock. 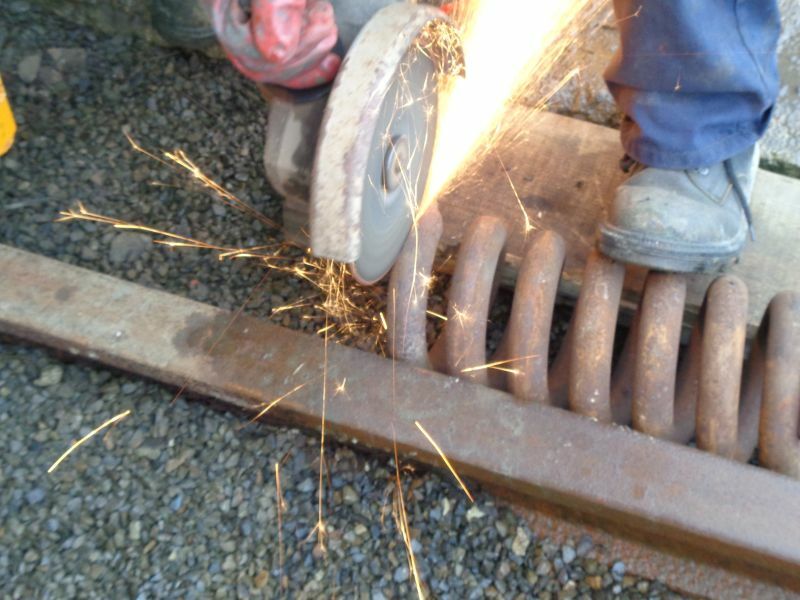 Protective steel plates will be fitted next, to avoid damage by action of the compressed springs, before the buffers are replaced. One of these prepared plates can be seen on an upturned buffer below the headstock. - The immaculate high gloss white paint finish given to the interior of the CCT 94691, by Geoff Brookes our usually solar-powered painting machine. With a bit of imagination it conjures up an image of the interior of a military ambulance train "operating theatre"! - The photographer stood outside, in wind and heavy Dartmoor rain, for H&S reasons, whilst an angle grinding session took place. 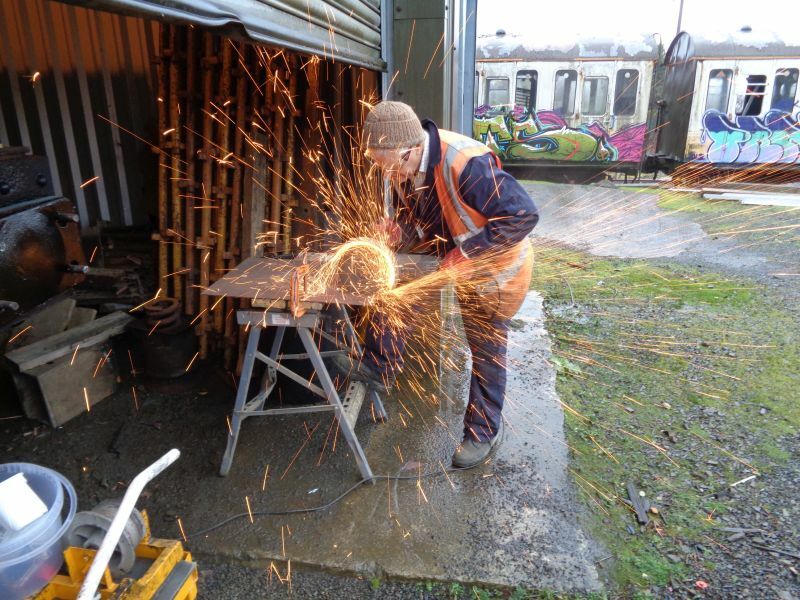 One regular C&W Thursday member has taken a shine to working in the CCT and is depicted in the process of making a sheet steel, hand ash removal shovel for the brake van stove; the latter being a vital survival facility for the guard on days like today. 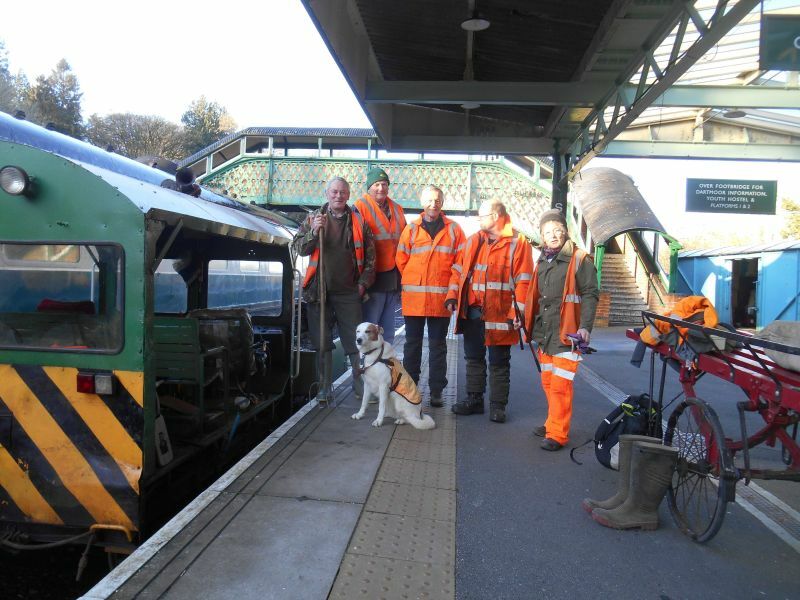 The shovel was handed over to the guard in time for the last trip of the day to Meldon. The freshly painted interior of the CCT, 94691. A stage in the manufacture of an ash removal shovel for the brake van stove. A mini C&W team of 5 today, the low number not being due to a reluctance to turn out in gale force winds and heavy rain. Painting the first topcoat on the Thumper continued whilst the main effort centred on replacing woodwork on the SR brake van LDS 55625, both internal and external. Chipping rust on the buffer-less head stock was finished and a coat of red oxide paint has smartened things up. Surface cleaning and examination of the brake piping at one end has been carried out and all seems well, although a new coupling hose will be required. A buffer, condition as removed. The buffer is resting on its head and as a result has pushed the spring, partially revealing it. Scraping off accumulated dirt, old grease and rust from the brake piping at one end of the SR brake van. Not for the squeamish! Once the buffers are refitted the next "heavy lift" task will be to replace the 8 perished rubber sandwiched dampers attached to the springs; one of which can be seen. A small team again today but a lot accomplished. 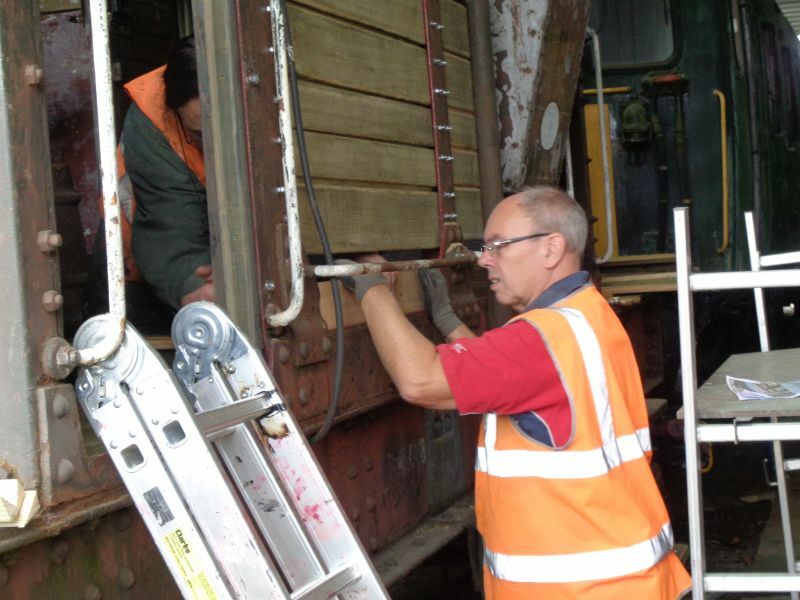 The first task attempted was to remove the 2nd buffer on the SR brake van after successful removal of the first last week. Three nuts came off easily, the 4th took some ingenuity and a little physical exertion, perforce a requisite of the C&W team. When the buffer came off there was some dismay as the internal heavy coiled spring had been broken in the past and had caused some damage to the internal guide tube; perhaps the result of the perceived historical heavy shunt mentioned previously. However, undeterred, work continued chipping away the corrosion on the head-stock to prepare it for a coating of anti-rust paint next week. Hopefully, we can either weld the spring (unlikely perhaps) or source a replacement. Work continued on the external planking on the SR brakevan 55625, both on one side and on the cabin door area, whilst the roof of Thumper 1132 received more paint and filling-in and rust removal continued on the cab front. 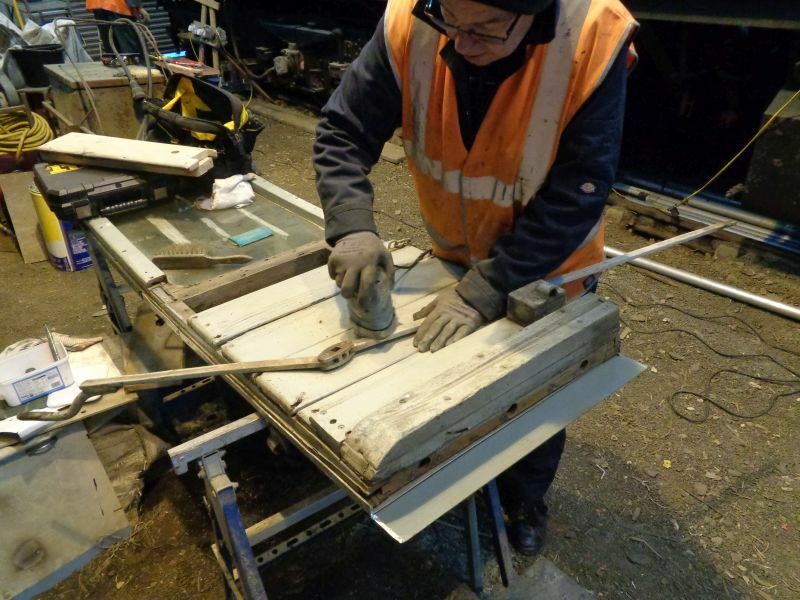 After work ceased a refurbished drop window grip bar (removed from scrap rolling stock) was taken across to the station and fitted to the Mk2a FK S13146 carriage, after several attempts at repairing the original item in the past failed. 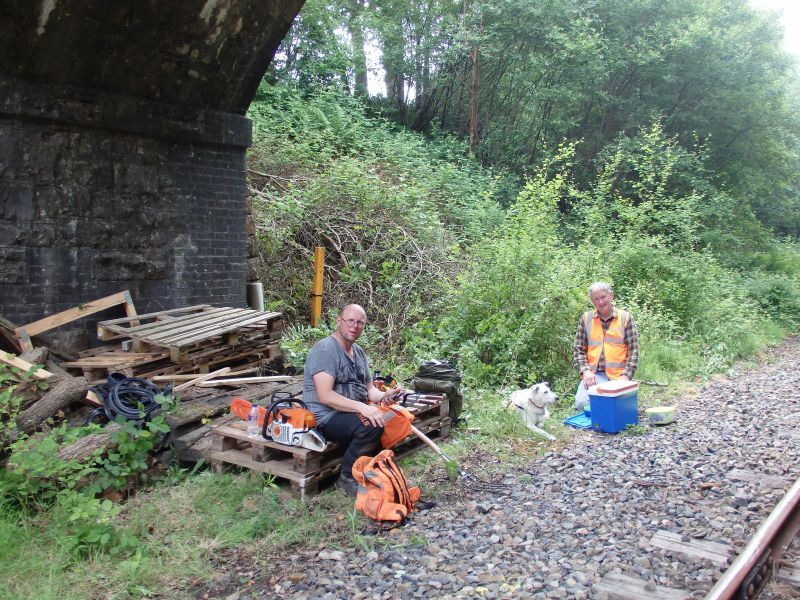 Patrick Doyle and John Davis marking out the cut for the last replacement plank on the side of the brake van. Ron Kirby in the background painting the Thumper's roof. And with a heave by Ron Kirby .... The slight droop of the buffer head pictured should have provided a clue that something was amiss with the spring. Yet another fine warm day with an even smaller team than last week. 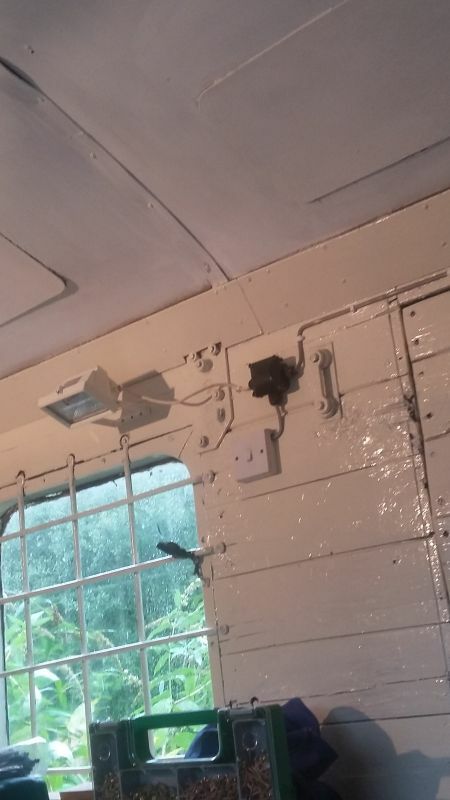 Two members stayed at the station initially in order to repair a drop down carriage window. This entailed warning the trolley PW maintenance team, who had gone in the Up direction, that a line-side carriage door may be opened and ladder placed near the track to do the work. The brake van was raided to provide a good old fashioned red flag, as no charged battery lamp could be found to place on the track as an advanced warning. In the event it was not needed as the repair was carried out with door shut. A long trek down the line to recover said red flag concluded the episode. Meanwhile back at Meldon it was discovered that an attempt had been made to force the entrance door lock. Ron Kirby dismantled the damaged mechanism and made a good job of fashioning a very professional looking protective metal plate, pop riveted to the steel door. Ron is now the expert C&W locksmith! Other work on producing planking for the SR brake van and chipping rust continued, whilst work started on preparing the Thumper 1132 power car front end for priming and undercoating. Undercoating on both sides of the Thumper is complete and work stated on painting the internal faces of all the doors. 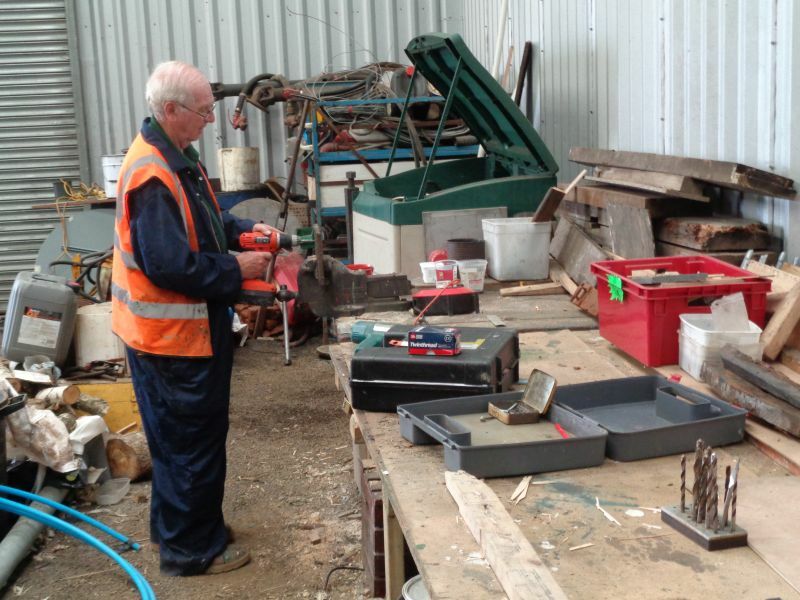 Other odd jobs, which included sorting out a recent kind donation of various useful hand tools and mounting an electric grinding machine onto a workbench - no more blunt chisels and screwdrivers. A beautiful warm day with a reduced C&W team due to holidays etc. Work was concentrated on Thumper 1132 and the SR brake van LDS 55625. Staging has been erected in readiness for painting compartment door trims and linings on the Thumper, prior to applying the top coat to the body sides. This involves more time spent fixing masking tape than it takes to actually apply the paint! Work continued painting the underframe and replacing a footboard. The shock absorbers have been carefully painted a contrasting blue - a nice touch amidst so much black gloss! A "Proper Job" by Alan Harris. 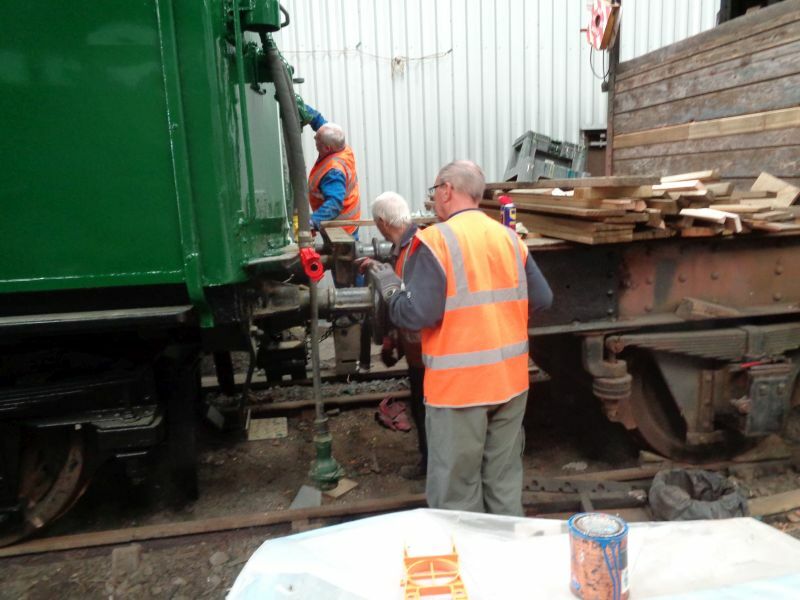 Meanwhile 5 members were busied both around and inside the brake van fitting more replacement woodwork and removing corrosion from the headstock and buffers at one end. The latter work revealed heavy rot in the 1" oak plate between each of the buffers and main frame which will require removing both buffers. With much relief it was found that the four hefty buffer retaining bolts turned quite easily after a 70 year sleep. Hopefully, pictures of our first, likely successful, buffer-removal epic will appear at a later date! A tricky bit of rebating for a bottom sill to the brake van side, using the flat-bed saw. The ever present John Coxon is in the background erecting the staging in readiness for the door painting phase. John Davis signals the end of another day's work on the SR brakevan LDS 55625. Patrick Doyle and David Bell seem unimpressed. Thumper 1132 being repainted in the Meldon workshop. Nigel Green at work, Alan Harris supervising. Alan Cocker demonstrates the Wickham replacement. The long march home at Halse summit. Whilst the usual unphotogenic SMT miscellania was carried out around Okehampton station, some of the team continued work on the CCT van 94691. More plating was added and small corrosion spots repaired with filler and sanded down, whilst Geoff Brookes prepared the roof for painting. Out of view, internal replacement of mains electrical fittings and complete re-wiring progressed. 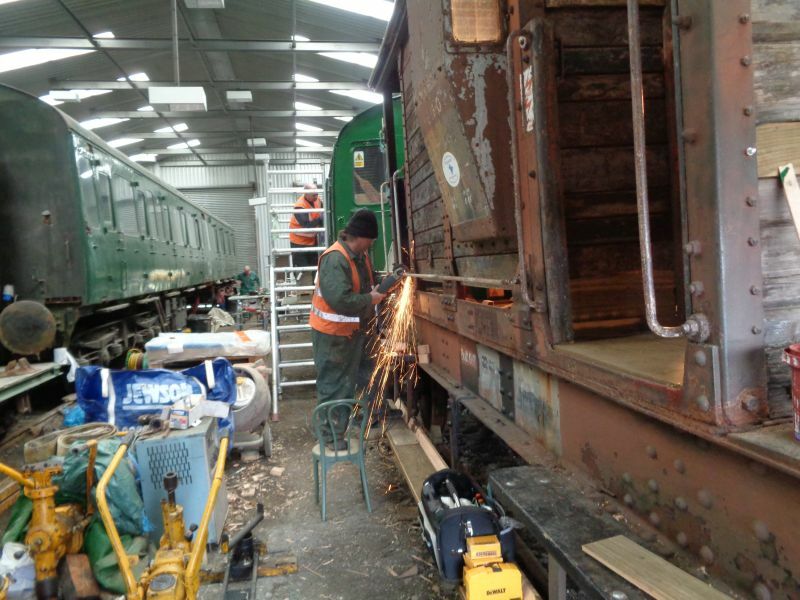 Work continued replacing woodwork on the SR brake van LDS 55625. A long slow process, as the timber has to be cut to various lengths and widths, rarely ever the same, then rebated, using hand saws and wood chisels; finally treated with preservative before fitting. Work sanding down the Thumper 1132 driving coach paintwork and repairs continued. 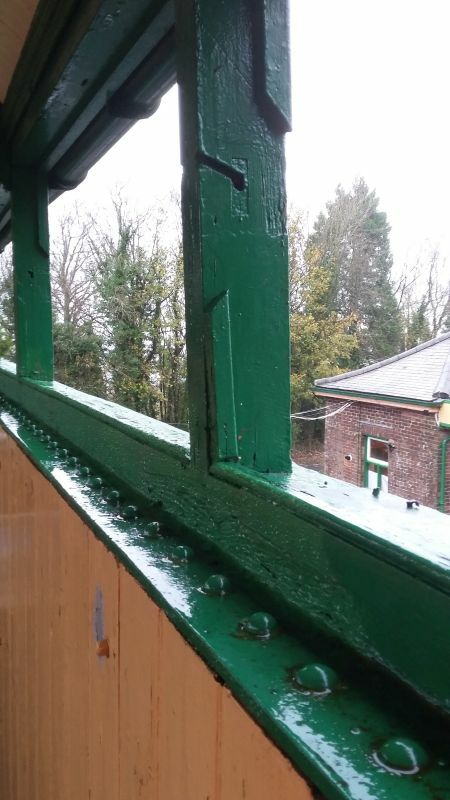 Meanwhile, we were requested (at short notice yet again) to find a replacement window panel and door drop-window for the recently vandalized Buffet Coach at Meldon Viaduct. Other tasks were cast aside and a team located suitable panels amongst the stored rolling stock that is beyond economic repair. (I think they came from Class 411 DMBSO 61742 - JK). It was a fairly straightforward job to lift the selected complete double glazed panel out, although very heavy; by drilling out the rivets holding the frame in. 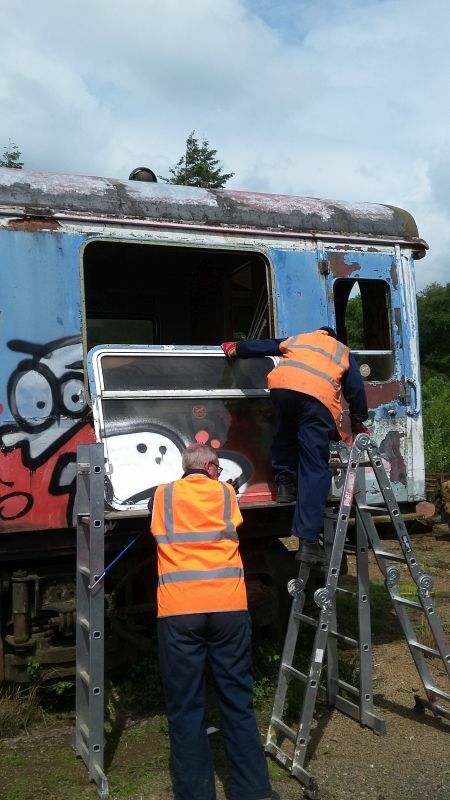 Once the thick coating of years of mindless graffiti had been removed from the glass, the panels were taken up to the coach for fitting by DRCIC staff. 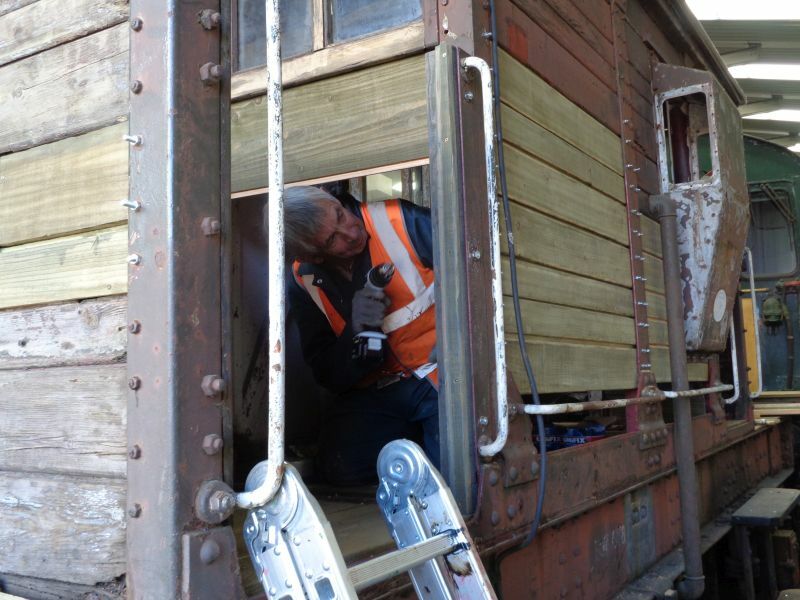 Work started on making repairs to the corroded panelling on the CCT van 94691. The internal space is partitioned and part has been allocated to the DRSA station maintenance team for use as a light workshop and storage area. It's more conveniently positioned than the GUV for tool storage etc., and those 'little' and 'not so little' jobs. As a bonus it is connected to the main electricity supply. The double doors, which were sealed off some time ago, have been reopened and the slam door handle/lock reinstalled using ingenuity and cannibalized items. Next step is to clear out years of accumulated junk, whilst an executive decision is awaited as on the external livery. Meanwhile the Trackside Team set off on the Wickham trolley, and the gardening ladies were busy wherever green fingers were required. Patching rusty panels on CCT van 94691. Plating cut and formed by John Coxon, drilled and fixed by Paul Vodden and then primed by David Bell. It's time we invested in a bigger brush. Preparation work continued sanding-down the unpainted side of the Thumper driving trailer whilst Geoff Horner "did something inside", which was too dark to photograph! 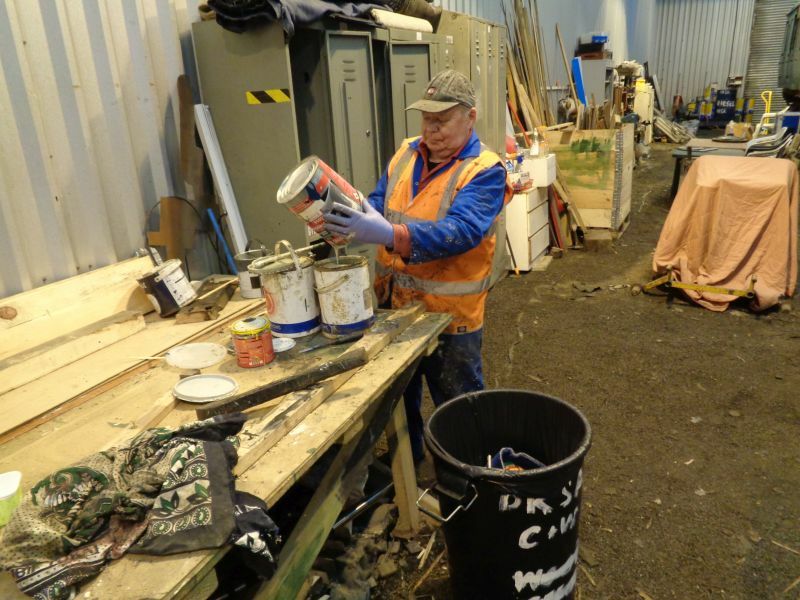 Meanwhile Alan Harris continued to make an excellent job of repainting repaired damage to the toilets in the Visitor Centre, caused by water, following an overwinter burst pipe and subsequent collapsed ceiling. A couple of pics follow. C&W work isn't always glamorous. A good start has been made to fitting replacement rebated and prepared timber to the far side of the SR Brake van LDS 55625. The roof has been finished and awaits a fabric waterproof covering. 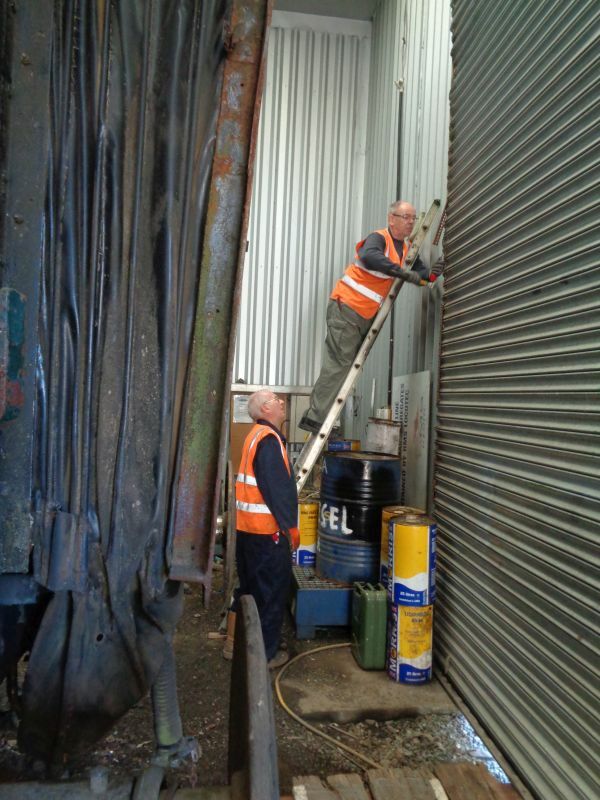 John Coxon captured trying (unsuccessfully alas) to align slats on the damaged roll-up workshop door. There must be an easier (and less nerve shattering) way John, but we just haven't thought of one yet. 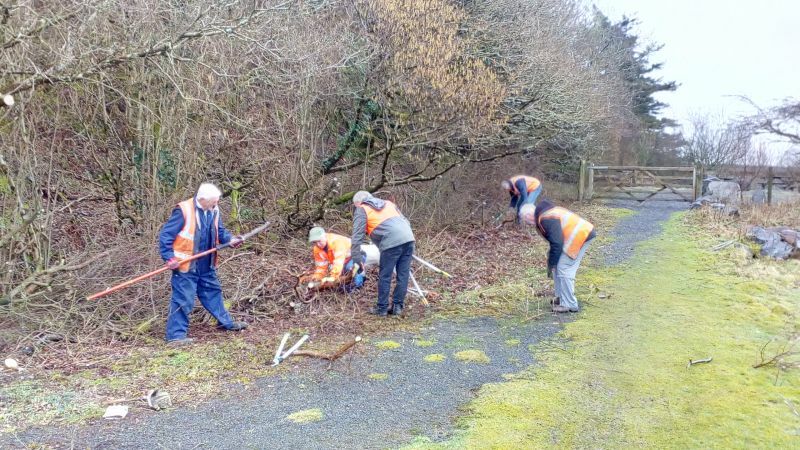 Recently there has been a welcome return of regular lineside vegetation and fencing parties, arranged and led on Saturdays and Sundays by Alan Cocker. Andy Turner, Alan Cocker, Rosie and the Wickham at Crook Bridge (no. 589) on fence replacement working party. The main C&W team spent the day at Okehampton station finishing off various outstanding jobs on the DRSA owned shuttle rolling stock, ready for the inaugural run on the 21st. (See first photo below). 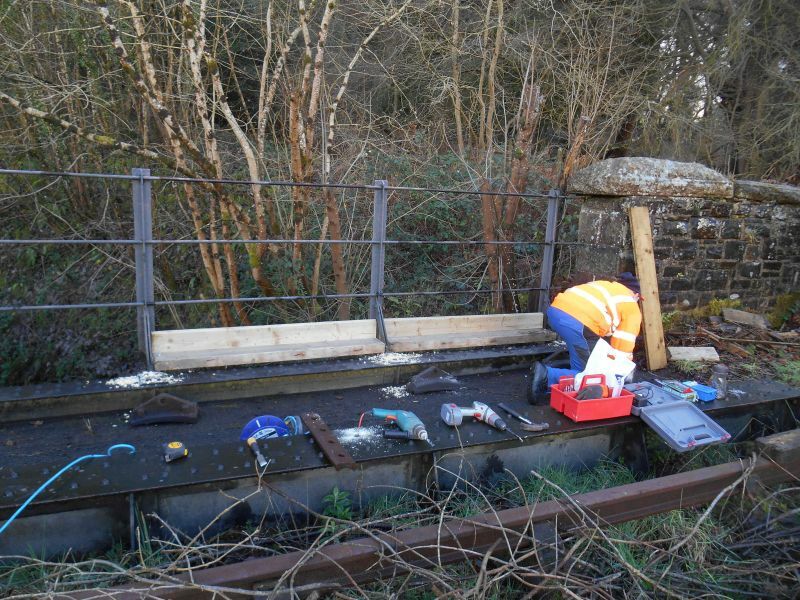 Two other members went across to Meldon to carry out cleaning and electrical repair work at the Meldon Viaduct visitor's area, being told by said visitors that it was a pity having to work on such a lovely day! Nigel Green doing some final retouching on the LMS brakevan 731411. The team working on the LMS brakevan flooring seem to have a very top-heavy management structure. In case you'd forgotten, this is what the Lab11 saloon interior looks like. A beautiful warm and sunny spring day and on arrival at Meldon our convoy had to be routed round a rail loading session. Thus answering the question as to what was happening to the rails pictured passing through the station last week - AI has a use for them elsewhere. The early morning coffee break was an excuse for everyone to celebrate your correspondent's 79th birthday with the cutting of a home made cake. Very little remained! Work then continued re-flooring the veranda on the LMS brake van, re-roofing the SR brake van and linking up the fuel pipes for the LAB11 generator; plus a bit of painting and scraping here and there. More mundane tasks were undertaken (Spring Cleaning), clearing out and cleaning the guard's compartment and kitchenette in LAB11, whilst the onboard generator ran happily on fuel drawn from the newly installed tank. "Bend it first before cutting", John and Ron. Geoff Horner looking pleased with progress. 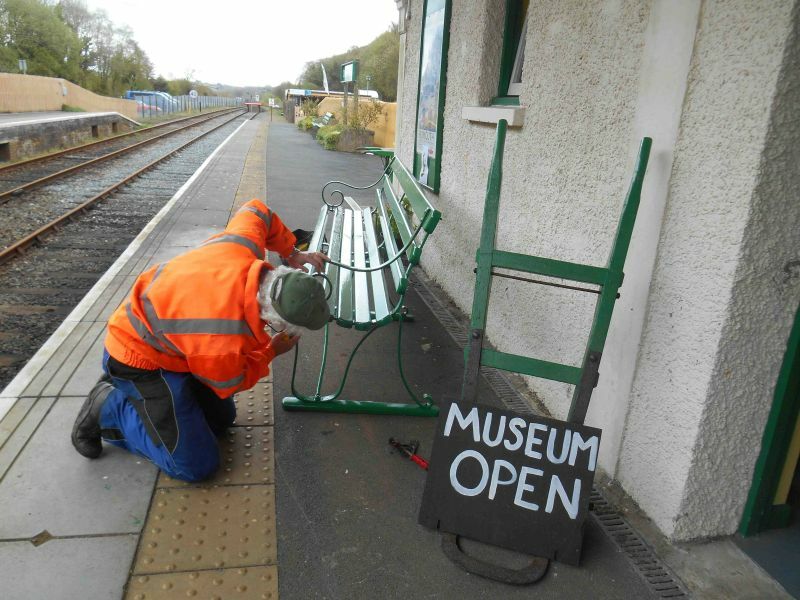 A very short notice request (David, there isn't any other sort - JK) to clean out the carriage formation for Good Friday's Meldon shuttle led to the C&W team becoming carriage cleaners for the first part of the day. Removing Christmas glitter from carpeting and seat fabric being the onerous part. After a quick lunch, some members left for Meldon to install the repaired radiator for the generator in LAB 11 and various other painting tasks. By late afternoon the radiator had been fitted (by John and Ron under somewhat cramped conditions), filled and checked for leaks and the generator tested. We expect to have the repaired fuel tank filled next week. Our regular correspondent, David Bell, didn't seem very inspired by Thursday's fare, reporting "Regretfully nothing of note to photograph yesterday. Work on the various tasks continued albeit being cold with a fair bit of snow still lying about up there. The LAB11 generator radiator has been removed for repair and the fuel tank is painted and ready for filling. Replacement planking for the roof of the SR brake van is being prepared. Perhaps something more interesting next week when my hands aren't frozen and smeared with black paint - despite wearing gloves! The stove in the LMS brake van was tested by Phil Hull and approved of by all and sundry "visitors" when smoke was spotted." 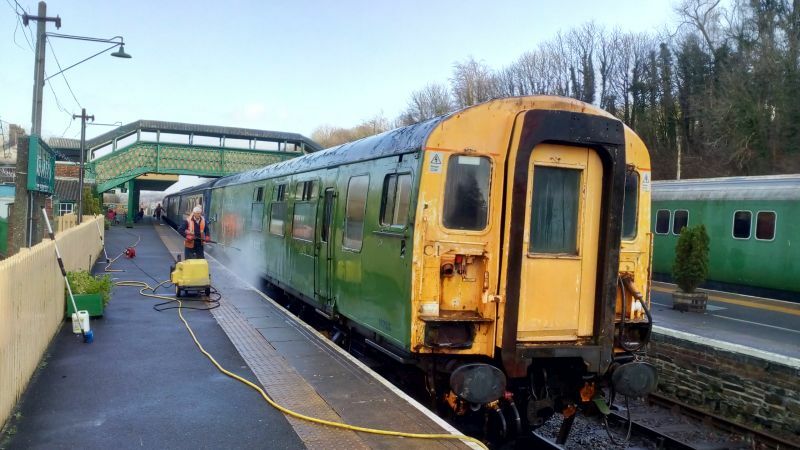 On Saturday a joint C&W and SM Meldon task force assembled, but first had the task of removing the Xmas decorations from the TtCT coaches at Okehampton, in preparation for use in the 'events' rake - a task apparently overlooked when the train was put away in December. This is railway preservation at its most satisfying. Coxon, Baxter, Vodden, Brooks and Horner, all miraculously doing something useful at the same time, with Caesar hiding and Kelsey shaking the camera. Undaunted by frequent rain showers, John Coxon and Ron Kirby persevered and managed to mount the generator fuel tank onto Lab11. However, the replacement welded-in bottom plate has altered the size of the tank slightly and one of the pair of refuelling pipes wouldn't fit onto the existing underframe mountings. It was decided to blank this off as being redundant and mount the tank with the remaining pipe. The tricky part of making up the copper-piped fuel lines remains for another day. Once the work on the fuel system is completed, the radiator on the Lab11 generator will be removed in order to repair a steadily worsening coolant leakage. Meanwhile work on replacement floor boards for the LMS brake van continued, requiring some dexterous open air work with a router. In the workshop the screech of sanding on the Thumper and hammering/scraping of the de-rusting team on the SR brake van continued unabated all day. A fine day so it was decided to refit the repaired diesel fuel tank [i.e. for the generator] onto LAB11. Lots of planks, poles and effort lined the tank up into the cradle which suspends it below the carriage underframe. Unfortunately the positioning of a modified type of fuel gauge on the tank required cutting out of part of the heavy steel suspension bracket. We therefore, ran out of time and the final heave and shove will take place next time - weather permitting. Other work, chipping rust on the SR brake van LDS55625 and painting the Thumper 1132 underframe continued. 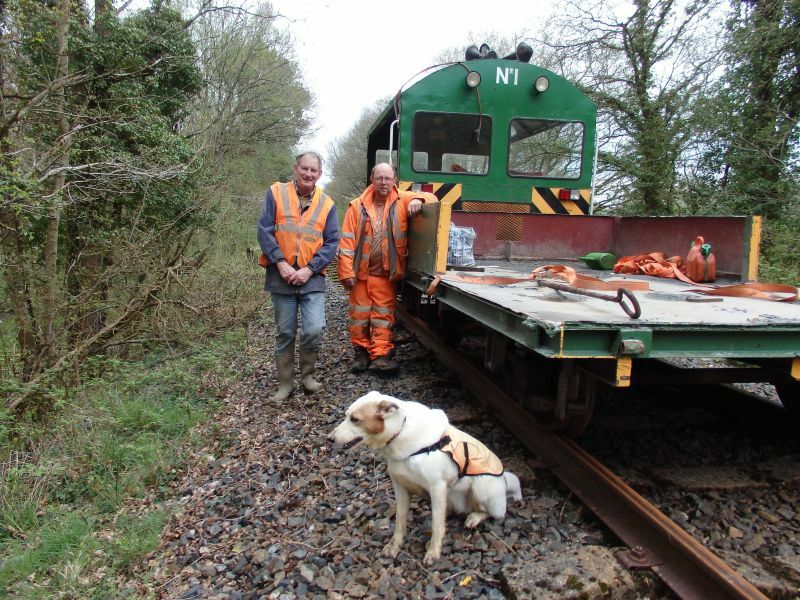 At last, after over two years of DRSA volunteers wanting to do some cutting back, and following an initiative by one of the DR permanent track and general purpose staff, 4 PTS trained volunteers (and dog!) 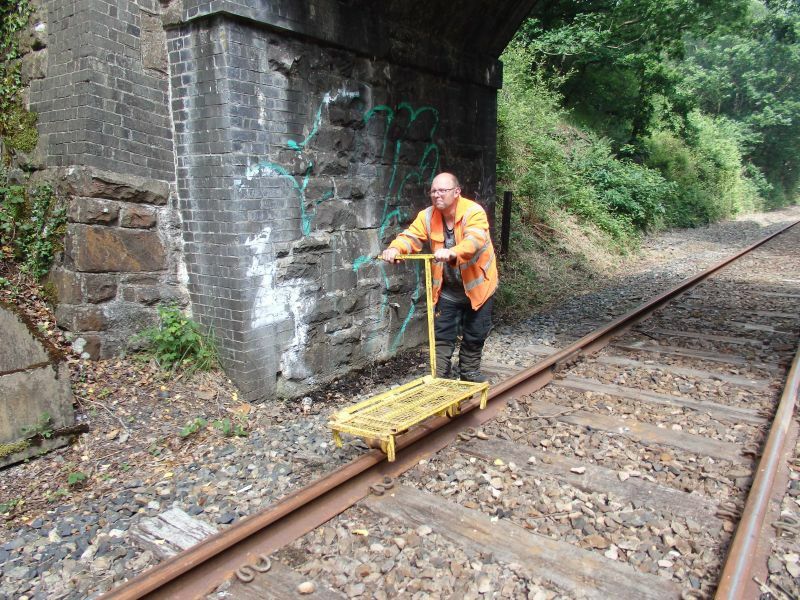 under the COSS (Controller of Site Safety) departed Okehampton at 0915 after a safety and general brief of the intended work, in the Wickham trolley and trailer. The site was just west of Bow Buttersland Farm level crossing in the engineering possession between Crediton & Okehampton. Here everyone worked hard on a perfect fine day, clearing trees cut down and logged by Alan Cocker and John Wills, feeding their branches to a bonfire. Leaving a tidy site, the team returned in the afternoon to Okehampton with a full trailer of firewood. Evidence that the DR permanent staff are also currently undertaking tree clearance and long reach flailing from their road railer was noted eastwards from Okehampton, having now nearly reached Sampford Courtenay. The work party at Okehampton prior to leaving for site - Tony Hill, Andrew Turner, John Wills, Alan Cocker, Sue Baxter and Rosie. Ann Rochester and Mavis Goff working on the beds on Platform 2, in conditions much worse than the picture suggests. The rest of us happened to find sheltered jobs. Veranda flooring on the SR brake van at one end almost completed. Patrick Doyle cutting off protruding bolt heads. Some typical Okehampton weather just about failed to deter a few hardy souls who turned out for a day of miscellany, like putting all the sacktrucks and barrows back on the platforms after their winter exile, and clearing junk out of the Ferryvan. The horticultural team cut down a tree. We were pleased to welcome a new recruit, Steve Brown, and hope we didn't put him off too much. 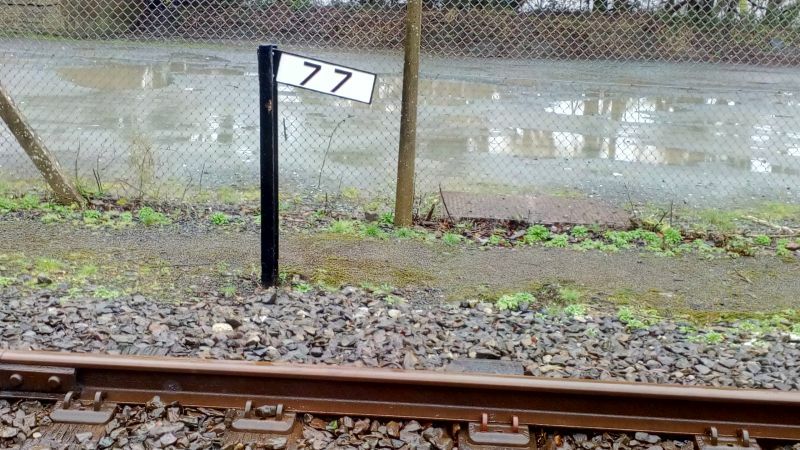 A couple of years ago the 1 in 77 gradient sign was broken in mysterious circumstances (could it have been hit by a digger? ), and has now been repaired, thanks to the cast iron welding services of CS Engineering in Crediton. It's had a coat of paint, and has been put up again. Pic below. Repaired gradient sign at Okehampton. Thanks again to David Bell for these images of today's action. 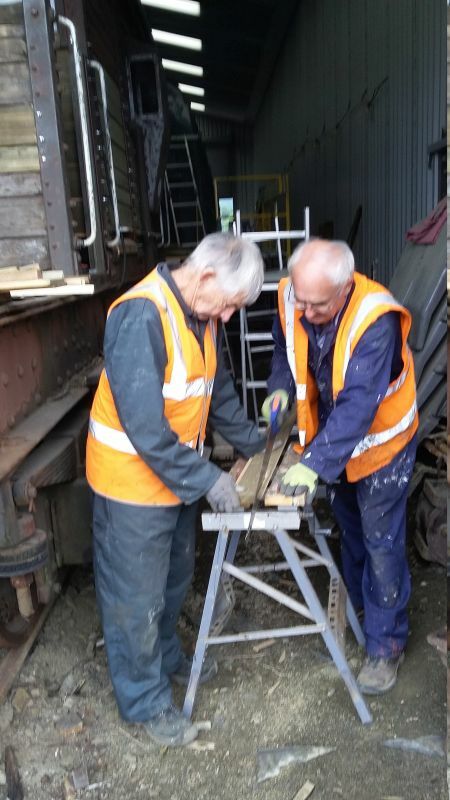 Patrick Doyle and John Davis cutting floorboards for one of the verandas on the SR brake van. The flooring of the cabin has been completed to a high standard. The undercoating, on the first side of the Thumper to be renovated, being finished off by Ron Kirby. 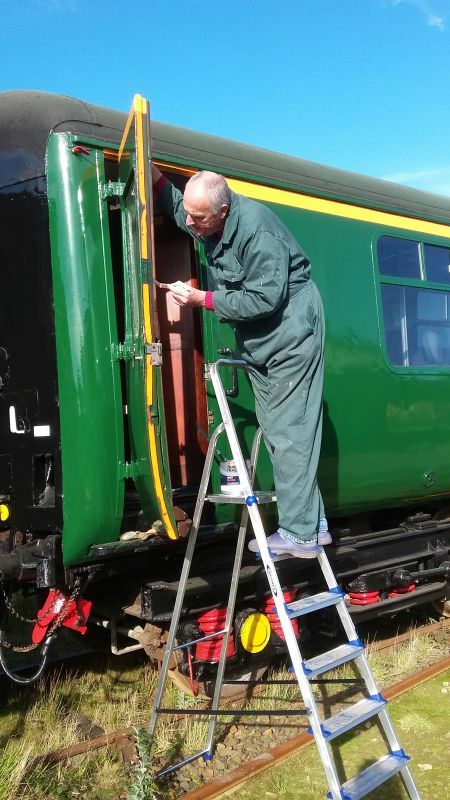 Alan Harris (taking a break from newly appointed Ticket Inspector) painting the under-frame and running gear of the Thumper. 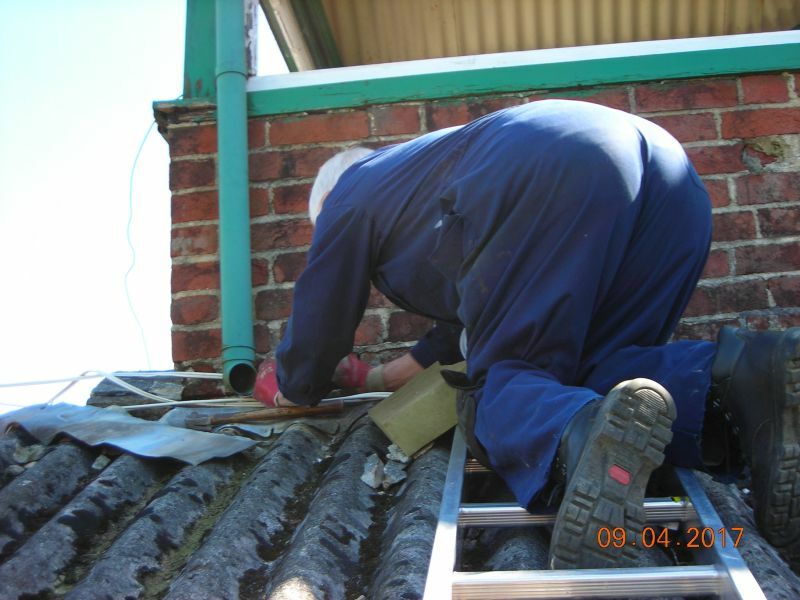 John Coxon cleaning out the guttering on the Thumper prior to painting more of the roof. 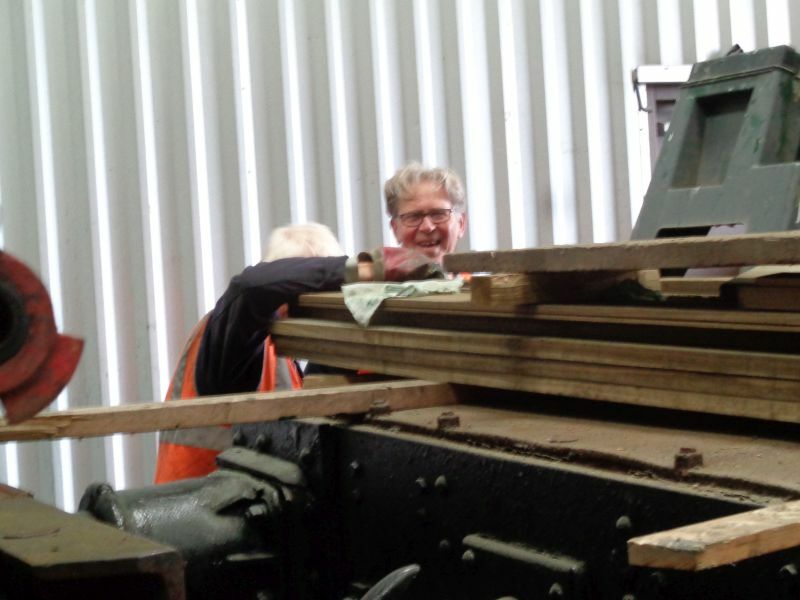 Cutting timber for a replacement floorboard in the LMS brake van. John Davis contemplating the remaining stack of timber for work on the brake van still to to be done. David Bell posing in the driving cab of Rocket. Patrick Doyle removing 70 year old floor retaining bolts with great effort and eventual success. John Davis measuring the cutout for the 5th floor board. 60831, the driving trailer from Thumper 1132, in the workshop having its roof repainted. The coach on the left is class 117 DMU centre car 59520. The body sides of 60831, the driving trailer from Thumper 1132, being prepared for repainting. Modifying a safety platform stanchion. 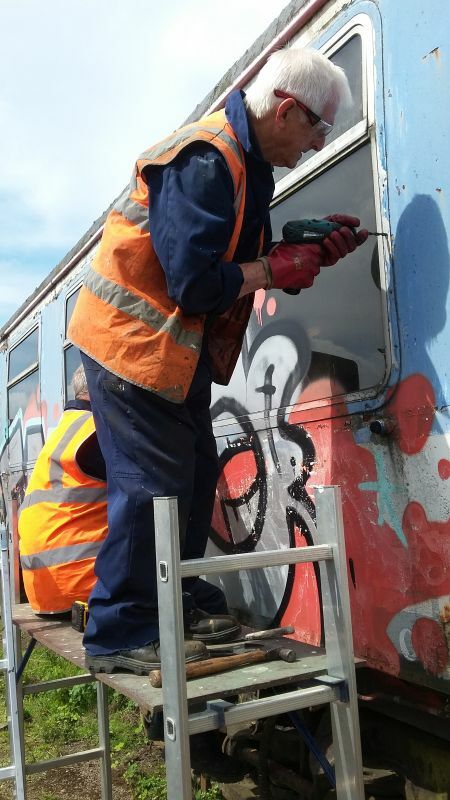 Alan Harris applying stove paint in the refurbished LMS brake van 731411. Alan has completed all the interior paintwork so far. No batch of pictures of the C&W team is complete without at least one shot of them having lunch. Here they are, hard at it in Lab 11. LDS 55625, with Patrick Doyle dusting off. Note new tanalised timber drying out. 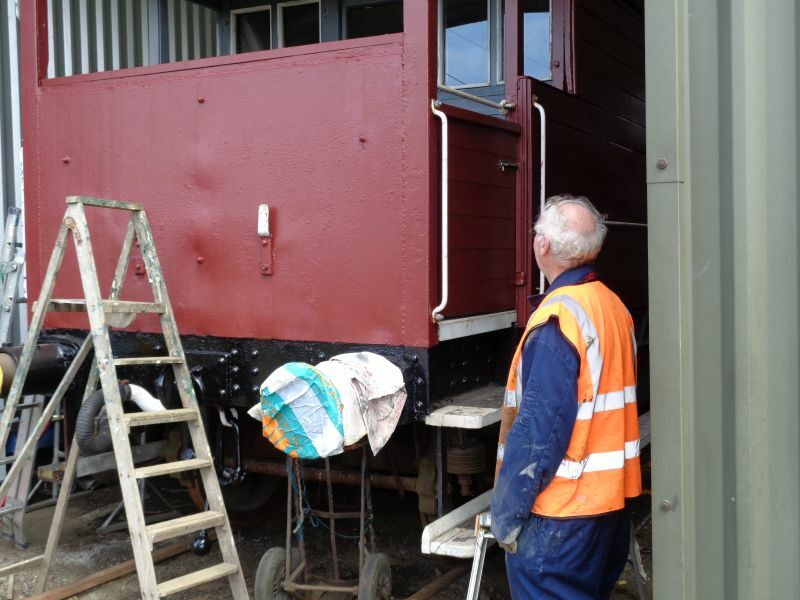 Patrick Doyle proudly contemplating the first new paintwork on SR brakevan LDS 55625 - red oxide on the floor. John Coxon and Ron Kirby working on the roof of Thumper 1132. Geoff Horner patch painted the sides today. Geoff Horner working filling in corrosion damage on Thumper 1132, Ron Kirby (our newest C&W member - welcome Ron) in the background sanding down paintwork. John Coxon sanding down paintwork, Ron Kirby in the background doing the same, and Geof Horner about to start sanding too - if he can find a sander that works! The BR(SR) brake van 55625 was stripped of woodwork paint, using a blow lamp, prior to being moved into the workshop. The rotten wood has been removed (mostly on the hidden side), and the new timber is on order. What a shame it doesn't have its wagon plates. Stock has been reshuffled at the Meldon workshop, providing the first daylight view of the LMS brakevan in its bauxite livery. The workshop now contains the SR brakevan for major timber bodywork, and the Thumper driving trailer for a refresh. Some finishing and interior work on 731411 and the Mk2 FK will continue in the open. The C&W team is also helping repair the vandal-damaged droplights in the Polar Express stock. Three quarters of DRSA's rolling stock outside the workship at Meldon, and all a credit to the Carriage and Wagon team. Nigel Green putting a few finishing touches to the interior paintwork of Mk2 FK S13436. Geoff Horner making a fine adjustment to one of the PE coach doors, supervised by John Coxon. 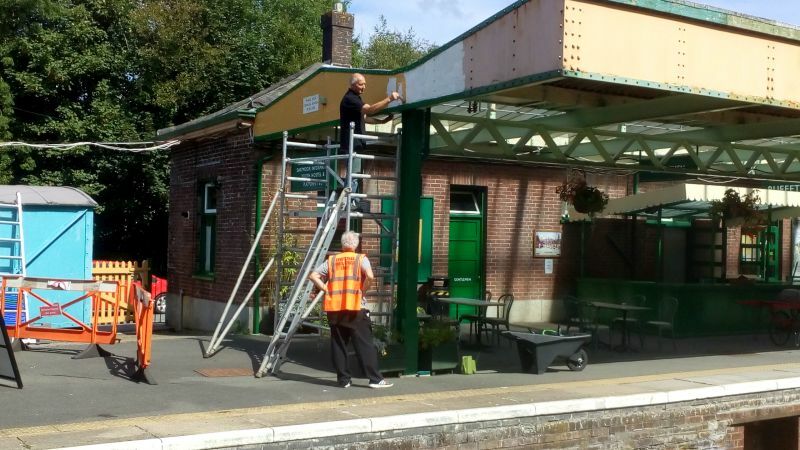 Geoff Brookes and Greg Bennett have spent a large part of the summer gradually repainting the Okehampton platform 3 station building. It has made a huge difference. Their project had a boost in late July when the C&W team spent a couple of Thursdays painting the inside of the canopy. 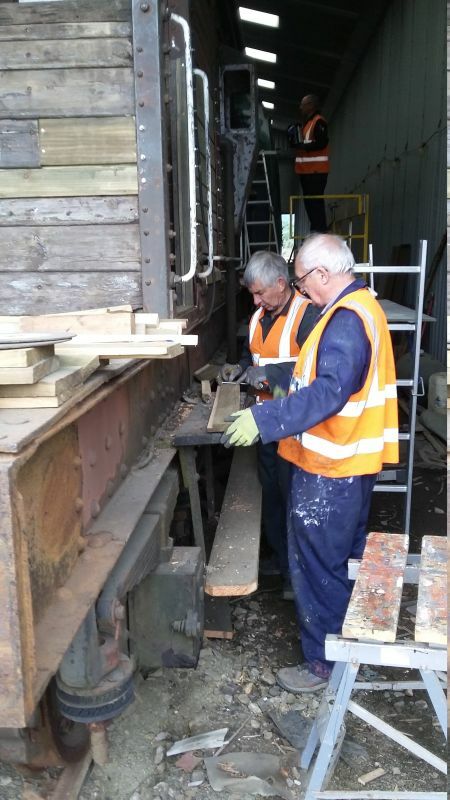 Meanwhile, John Coxon, David Bell and Jon Kelsey have been replacing some of the rotten timber which formed the base of the window frames and window sills on the footbridge. The new paint on the Okehampton canopy. The section near the platform edge will have to wait until we can arrange safe access. Geoff Brookes painting the Okehampton canopy, with Greg Bennett as safety man. John Coxon and Jon Kelsey preparing new window frame/sill timber for the Okehampton footbridge. Patrick Doyle painting the canopy, with Geoff Horner steadying the ladder. With a large team, two ladders and two platforms, rapid progress was made. 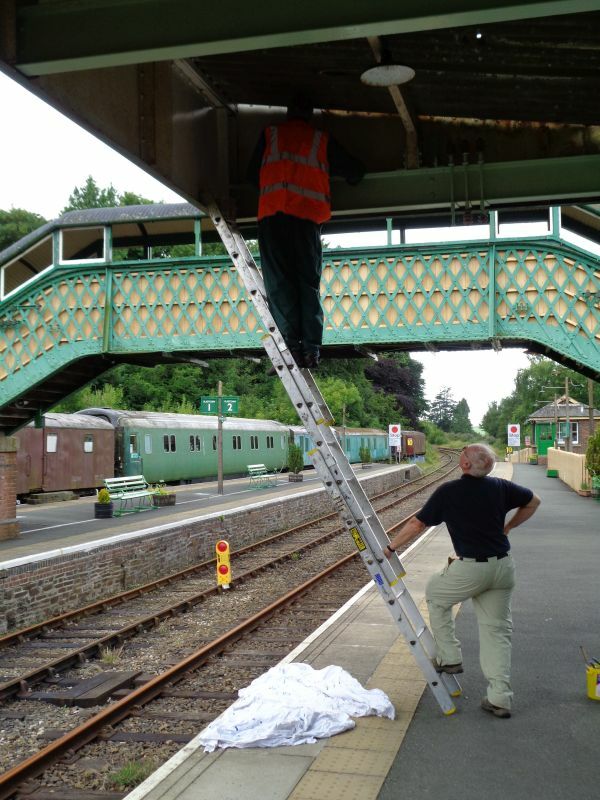 The C&W team slummed it at Okehampton Station for a couple of Thursdays in July, blitzing the paintwork of the canopy. By a million to one chance, they were having a break when Paul was out and about with his camera. 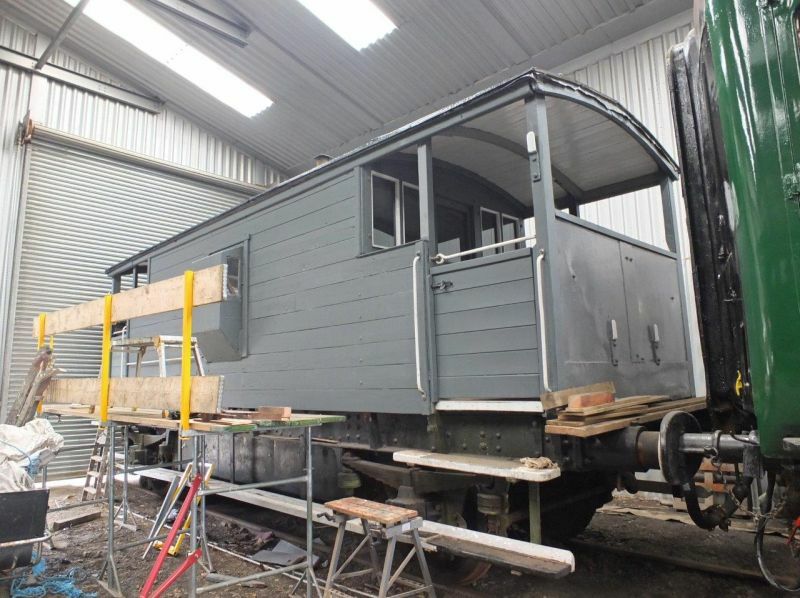 Our thanks to David Bell who has sent in a couple of photos showing good progress on both our brakevans. Geoff Horner watching paint dry. Nigel Green has put the first coat of the new bauxite livery on the LMS brakevan 731411. 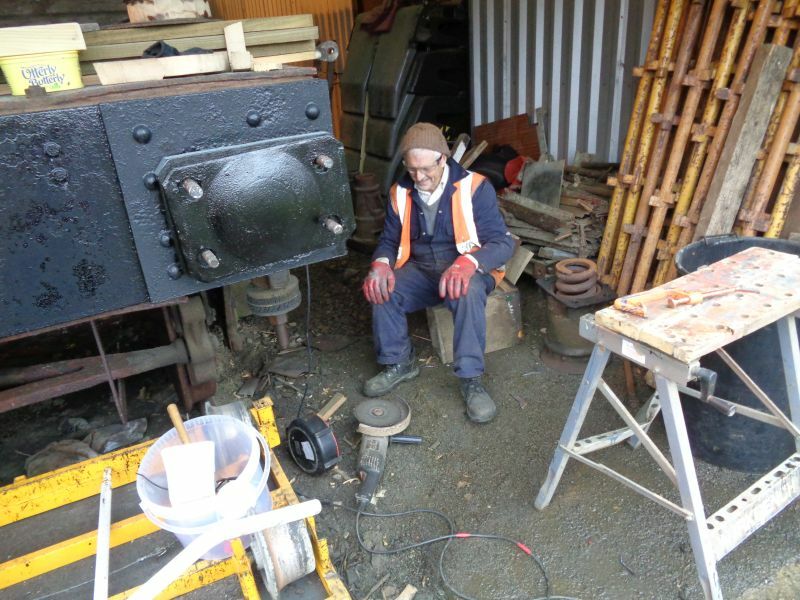 Patrick Doyle grinding out rusted-in bolts in the SR brakevan LDS55625, with John Davis pausing from stripping out decayed interior woodwork. Nigel Green again, painting 731411. We have a photo of it in engineer's service in 1971 in this livery. General view of the SR brakevan LDS55625 showing work proceeding with stripping the rotten woodwork. 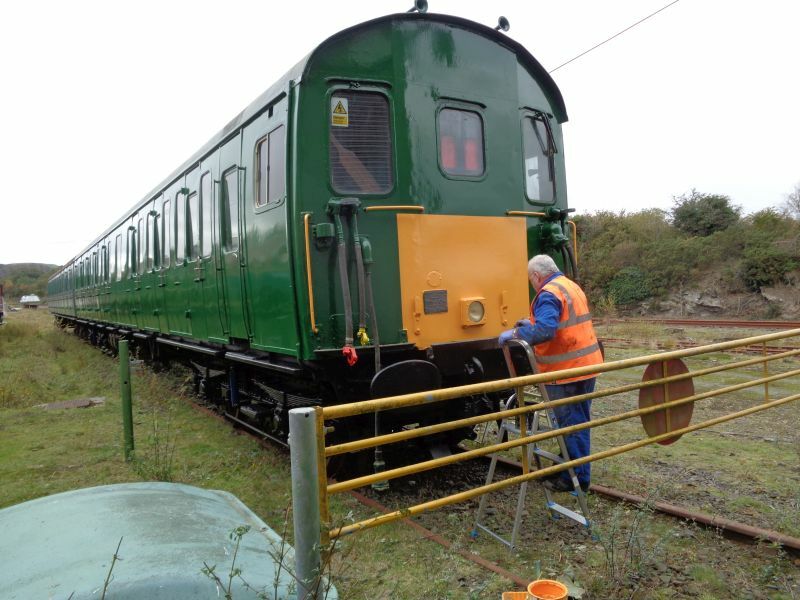 Last year, through the good offices of Tony Hill, DRSA repatriated 4 Southern Railway seats, purchasing them from Dunster and Crowcombe Heathfield on the West Somerset Railway (see News Item 08/11/2016). Repainting them from GWR to SR livery was a welcome sheltered outdoor job for sunny winter days, and three are now complete apart from lettering. The fourth, requiring some remedial woodwork, isn't far behind. Despite the impression given by the photographs, most of the work was carried out by Geoff Brookes and Greg Bennett. Jon Kelsey and Tom Baxter with one of the seats now resplendent again in Southern green. 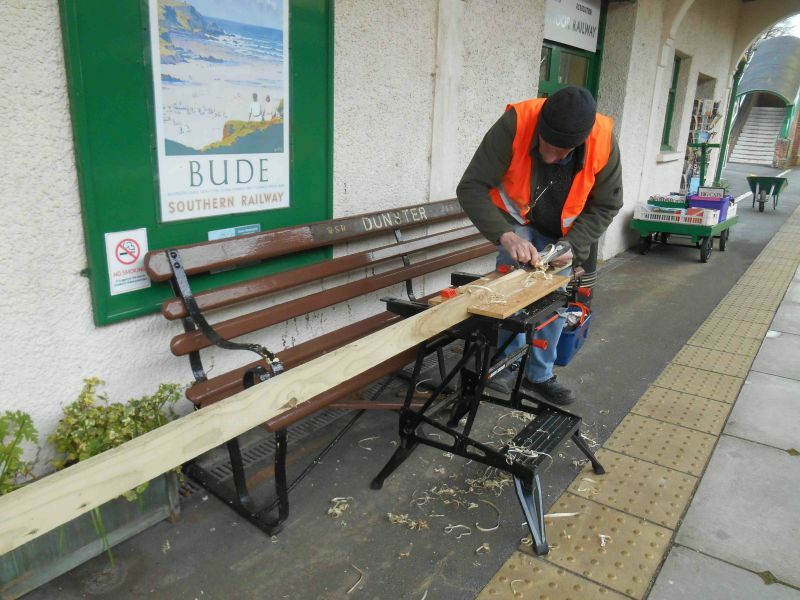 The seat is turned to face the Bude bay siding for photographic purposes! David Bell has submitted a few photos taken at odd moments during recent SMT work sessions. It's not true that John Coxon does all the work. Tom Baxter watching John Coxon discovering that the pressure washer is broken. John Coxon relocating the Platform 2 stop sign. Work is under way on the FK, S13436, renewing flooring and preparing it for an external repaint. Sharing the workshop is the LMS brakevan 731411, which is being prepared for repainting in bauxite, having had its woodwork renovated. There's also been some progress on the SR brakevan LDS55625, reported on its own page. LMS brakevan, with woodwork repairs complete, being prepared for painting. New timber on LMS brakevan 731411. In the background is FK S13436, being repainted. 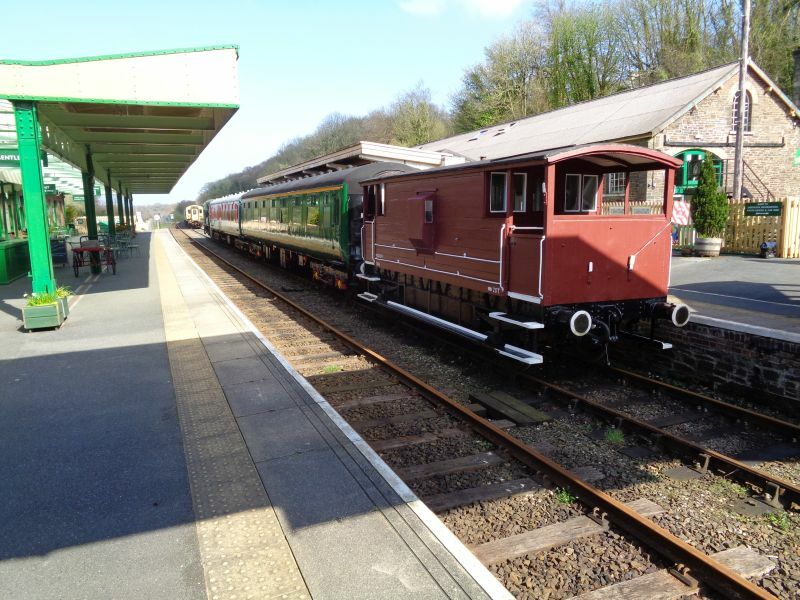 Our thanks to Geoff Horner for this photo showing the completion of the replacement boarding to one side - the south - of the LMS brakevan 731411. The CWT has completed the replacement of a couple of rotten floor boards in the cabin. 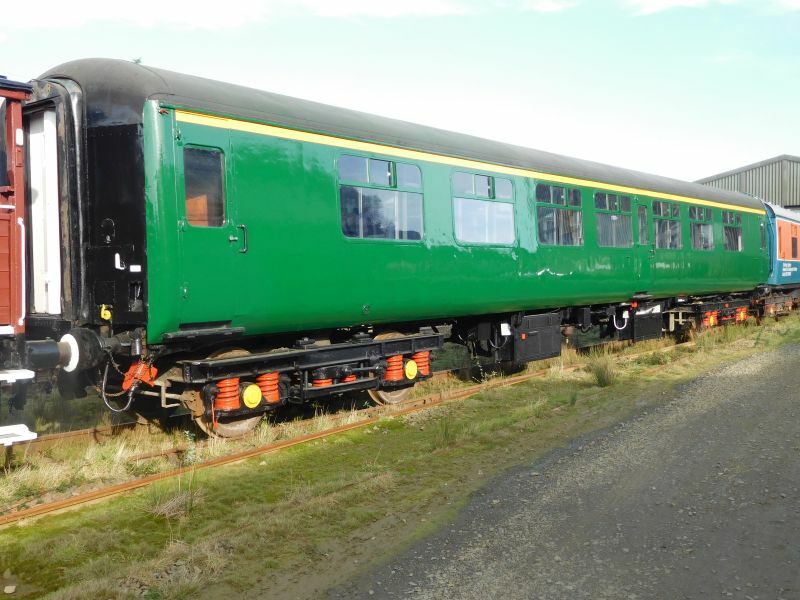 After much debate about livery, the 'FK' S13436 has had one coat of Mid-Brunswick Green applied to the whole of the south side and partially to areas of the north side, plus the black to the two ends and areas of the under frames. Unfortunately the confines of the shed and the location of the trestles etc meant it was not possible to get a decent photo of these areas. Since Christmas, the main project has been the refurbishment of the Okehampton station booking hall in time for the Sulzer Weekend, though the usual mission creep meant we didn't quite achieve that. The painting is now mostly done, and it will look much improved for the Sulzer event, though there will still be some jobs to do afterwards. In particular the noticeboards need to be revamped. Paul Martin has masterminded it, and done a fair bit of the work, along with John Coxon, David Bell and Andy Turner, with Baxter and Kelsey providing odd bits of help. Thanks to all concerned. A lot of work has been accomplished in a short time, and the first impression of the station much enhanced. In other news, the wooden wheeled station barrow is now back on display, having had its superstructure painted last summer, and the axle assembly stripped and painted this winter. You may notice that one of the wheels is still unpainted. The original paint was applied on top of a sort of bitumen coat, and it took so long to strip there was only time to do one wheel this winter. There is some evidence that the barrow is original to Okehampton station. 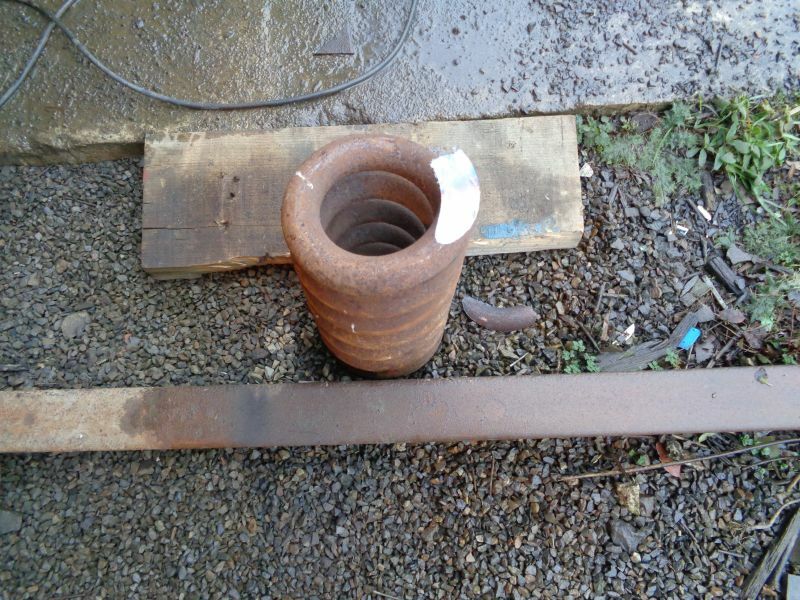 The axle and one of the axle brackets was found to be stamped 'S.W.R.'. Does anyone know more about it? The old BR Barnstaple sacktruck which languished for several years, rotten and broken, in the upside concrete building over the Klondyke Road bridge, has been rebuilt with the worst of the rotten wood replaced, though it still doesn't enjoy 100% good health. The repainted station barrow and rebuilt Barnstaple sacktruck. 'S.W.R.' stamped in the axle of the wooden-wheeled station barrow. Geoff Horner has sent in the following pictures showing the state of the various current C&W projects, with (entirely unnecessary) apologies for the state of the light in the workshop. The FK, S13436, has received an undercoat on its south side. Another view of S13436 in undercoat. We await a decision about its new livery. 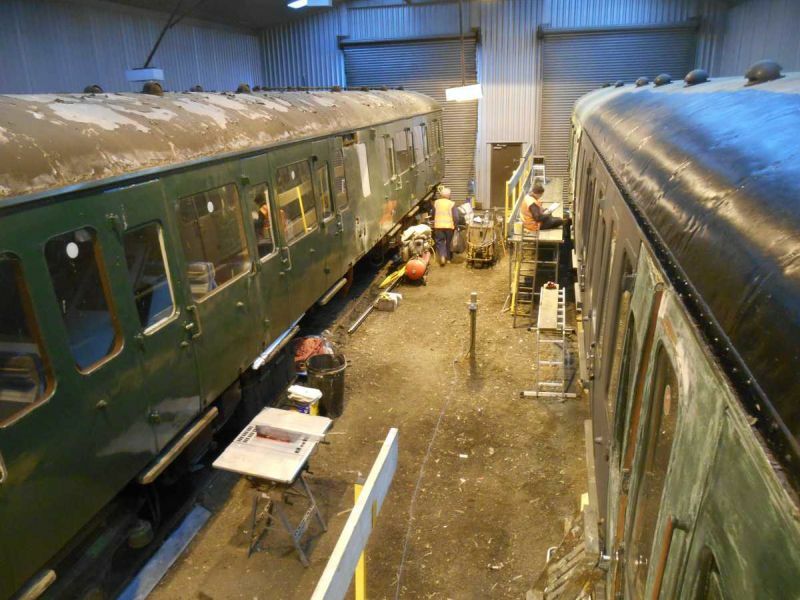 Class 117 DMU centre car 59520, in the workshop for refurbishment and painting. For the last few weeks the C&W team has been working on the paintwork of some of the Polar Express stock. Geoff Horner has sent in some pictures of the current state of play. The first carriage resplendent in 'PE Blue'. Alan Harris applying a few finishing touches. 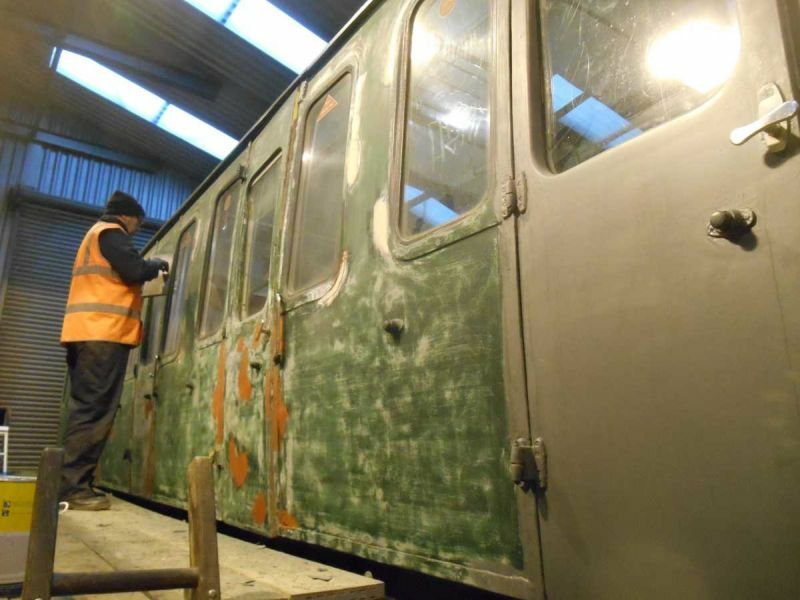 The second carriage being prepared for painting. A start made on the paintwork on the second carriage. Last winter we acquired some redundant desks and cupboards from Devon County Council, for use in the museum and at Meldon. We were extremely grateful to John Caesar's Met Office colleague Paul van der Linden who helped with transporting the furniture from Exeter in his Land Rover. Paul must have seen something he liked, as he subsequently started volunteering at the railway. 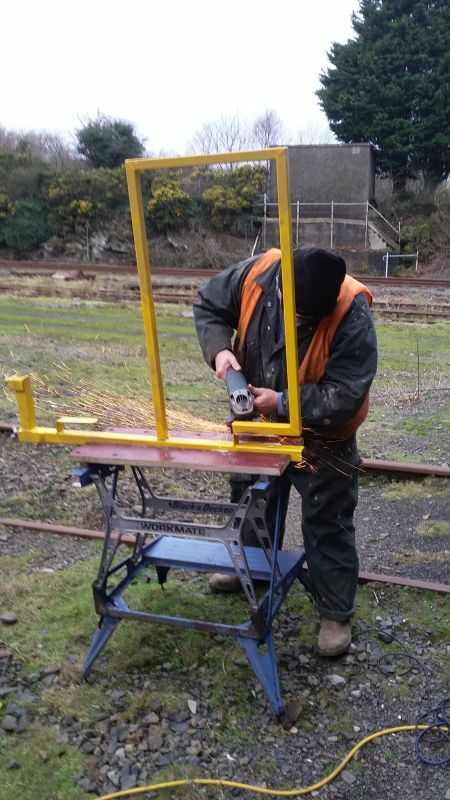 Paul has taken on the task of restoring the platform ticket machine which has been languishing at Meldon. The hope is that we will be able to set it up on Okehampton station dispensing souvenir tickets. Having fathomed out how it works, and identified the problems we need to overcome, Paul has resprayed the casing. Here are a few pictures of the work done so far. The ticket machine after spraying the top coat. Today's best news was a visit from Geoff Brookes. Geoff went for major surgery to his leg a couple of weeks ago, and none of us expected to see him for a while yet. 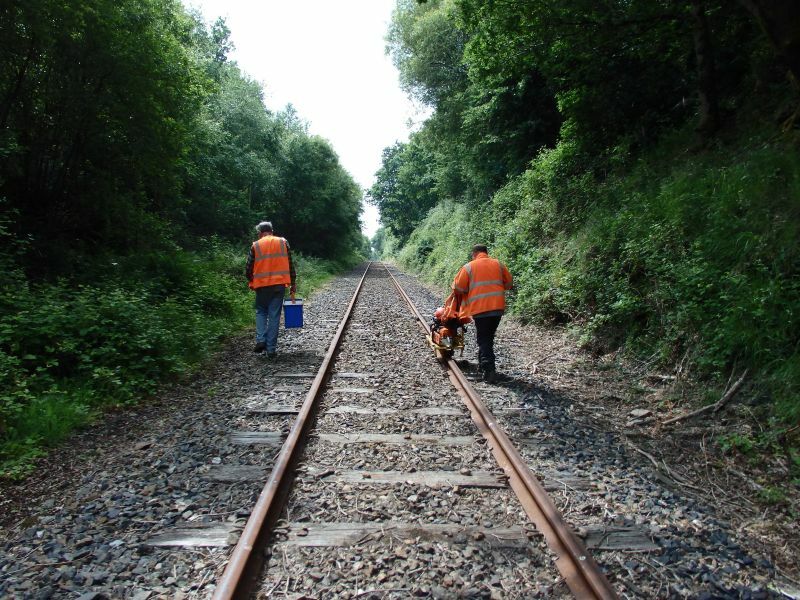 It seems the operation was a complete success, and Geoff is already taking long walks, and keen to get back to the railway. This seems a good opportunity to point out to those who haven't noticed, the condition of the bamboo-coloured fencing on platform 2. We seem to have miles of the stuff, and Geoff, assisted by David Bell, has painted most of it recently. See pic below. Tom Baxter was gainfully employed reinstalling a lamp at the end of platform 3 which had been broken by others. In a mere 7 months we have repaired and re-erected it. Now it's even green, rather than plastic grey. There's no limit to what we can achieve. Other pic below. David Bell spent the morning weeding around the platform 2 entrance, which now looks much tidier. David wondered why he was bothering with the bike stands as no-one ever uses them, and 5 minutes later they were occupied by 2 Dutch visitor's bikes. 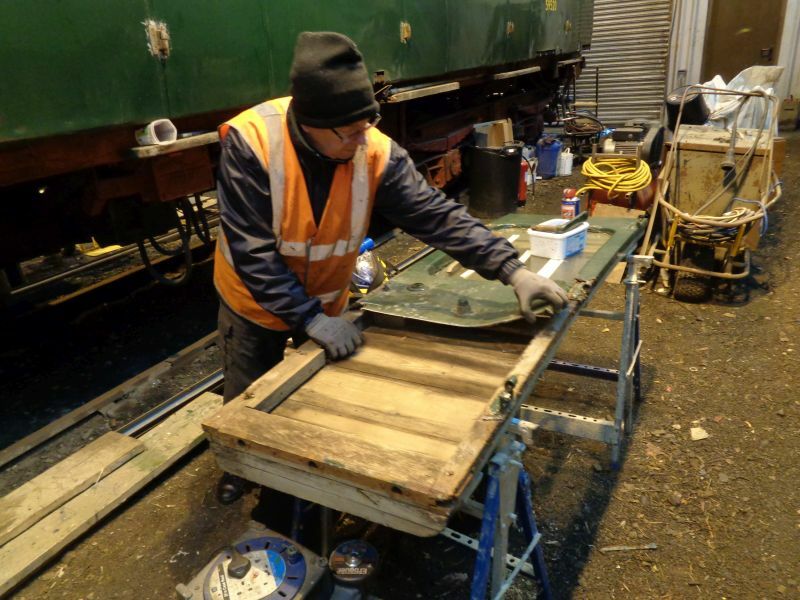 Jon Kelsey started preparing the nice old wooden wheeled platform 2 barrow for repainting. All being well the inappropriate modern repairs it has received recently will be hidden when it's finished. The lamp repaired and reinstalled. Don't look too closely at the paintwork on the speed limit, or the absence of it on the post. Geoff Horner has sent in some photos showing progress on 4CEP Mk1 TSOL 70273. Work has started on the first top coats of rail blue and rail grey, and the white lining. It's going to look pretty impressive when it's finished. Geoff Brookes and David Bell pressed on with the endless fence painting, and further titivation of Bryn's room. The rest of the gang headed over to Meldon to press on with the SR brakevan - details on the LDS55625 restoration page. Geoff Brookes and David Bell had another solid day's painting the fence at the back of Platform 2, which is starting to look very smart. John Caesar pushed on with preparing "Bryn's room" for opening as a museum annexe. For the rest of us it wasn't our best day, though not for want of trying. 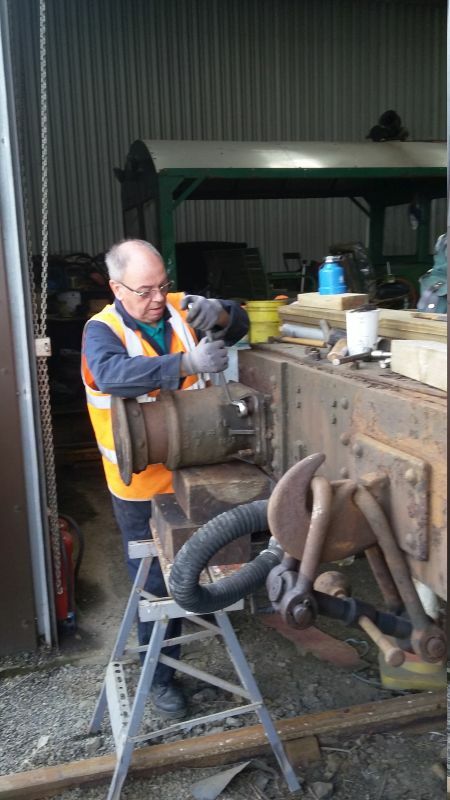 Tom Baxter, Geoff Horner and Jon Kelsey went to Meldon to remove an axlebox bearing from the SR brakevan, failing miserably through deficiencies both of equipment and understanding. On our return, desperate for achievement, we put up a P2 exit sign which has lain unused in the GUV for years (pic below). 2 halves of a cast iron lamp post from Bude, recently donated. We also have the lamp fitting to go on top. 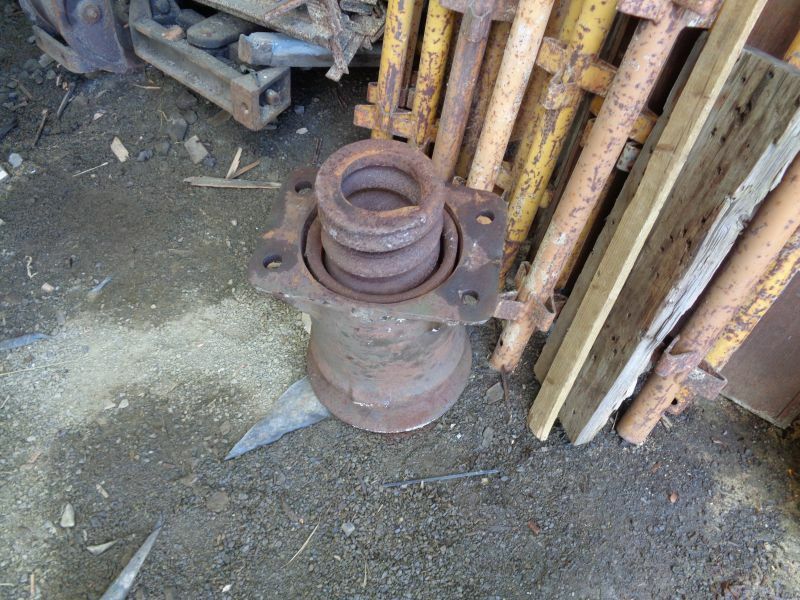 We don't think it is from a railway, but when restored it will make a nice period piece. Our thanks to Geoff Horner, who has submitted the following photos showing the C&W Team's progress on ex 4-CEP Mk1 TSOL 70273. Mike Ireland does final prep work to weld repairs at east end. Nigel Green hard at it. If 47828 is left here for too long it might get painted green. The last 2 Saturdays have seen a healthy turnout of volunteers. New member David Bell joined us on both days, and we were pleased to see former regular Mark Williams today. Mark and John Caesar worked on the display in 'Bryn's Room', the former training room adjacent to the museum, (so called because the ex Met Office mannequin who models Arthur Westlake's uniform was apparently called Bryn). Geoff Brooks has spent the last couple of Saturdays fitting shelves under the worktop in the shop store room, enabling the space to be used much more efficiently for storing books. We're grateful to David Bell for donating the timber for the shelves. David, John Coxon, Geoff Horner and Jon Kelsey spent the day at Meldon rebuilding rotting buffet picnic tables. Naturally they were in worse condition than we first thought, so progress was slower than expected, but one is finished and one is half finished with two more to do, and we did start with the two worst. With some warmish sunshine and steady numbers travelling on the trains and visiting the buffet, Meldon seemed a pleasant place to spend a Saturday afternoon. 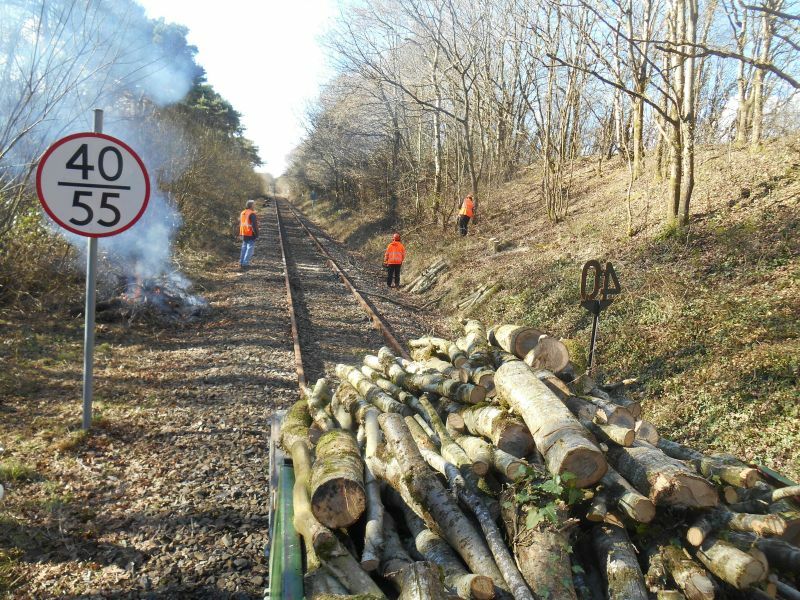 Our thanks to Geoff Horner who has again submitted a few photographs of recent C&W activity, shown below. All except the last one show the work on the privately owned TSO 70273 - a Mk1 carriage from an ex SR 4CEP EMU (Class 411). It is being prepared for use (with tables fitted in the saloon) with the air braked 'heritage' set. David Clegg & Nigel Green getting down to bodywork preparation and applying some grey undercoat. Lighting is not at its best in the shed at this time of year! Alan Harris getting to grips with painting the underframe. More challenging lighting. Alan Harris working his way round the underframe. C&W members Patrick Doyle (at door), John Coxon and John Davis (foreground) getting to grips with the door sliding window gear. Grey undercoat now complete for half the carriage length. The safety guard rail and barrier is part of the H&S equipment DRSA has bought with the help of a grant from Okehampton United Charities. Nigel Green is demonstrating how difficult it is now to fall off! Not really C&W's domain, but the Wickham trolley has had new aluminium roof panels fitted and just at the moment is the vehicle most likely to be seen moving around the railway! A bunch of the flowers picked regularly over the summer for the buffet, from the wildflower patch by the Ladies entrance maintained by the horticulture team. New recruits for the horticultural team. 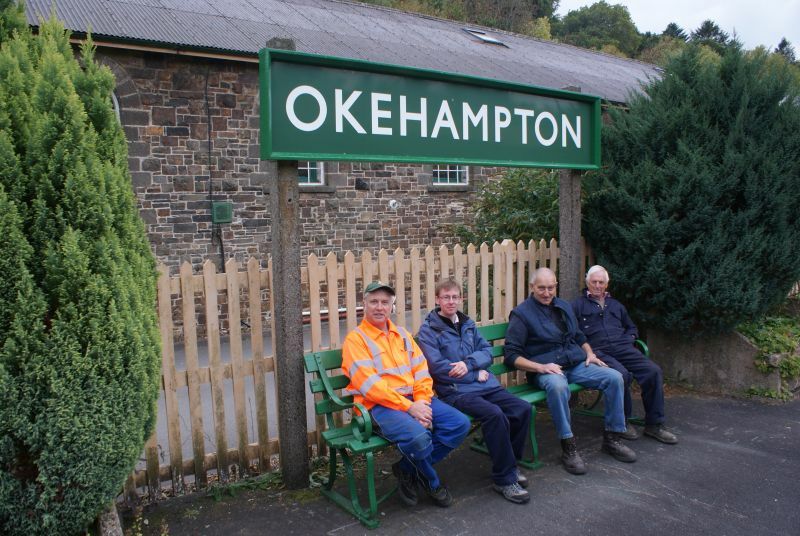 Today's highlight was the new Okehampton platform 2 running-in board frame. We were prompted to replace it when the rot in the old frame was a little too apparent in some well-publicised pictures taken at the museum reopening. Erecting it was a bit nerve-wracking, as it involved wrecking the old one, but it went surprisingly well, though it's probably a good job we got it out of the way before next week's H&S training. Thanks, but we don't need anyone to point out that the frame is a slightly different shade of green than the rest of the sign. Tom Baxter says the frame colour is the correct one. Today unfortunately signalled the end of the SMT being able to use the DRSA shop as a temporary workshop, as several members of the shop team were hard at work and should have it in service quite soon. Getting there. The DRSA shop is starting to take shape. Geoff Horner is putting the other team leaders to shame with his second report in as many weeks. 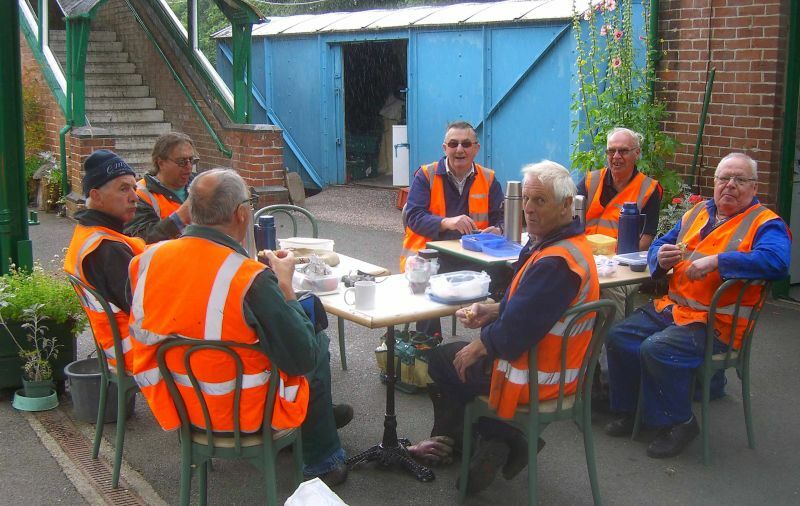 The first picture, taken a few weeks ago during a momentary pause in the activity in the Meldon workshop, shows a couple of the welcome new faces amongst our volunteers. Alongside our newly refurbished ex LMS brake van, the ever smartly turned out Phil Hull (L) joins new C&W members John Davis (2nd L) & Patrick Doyle (back) as C&W stalwart Dave Clegg (seated) demonstrates how C&W go about their days work. The second picture shows DRSA member Julian Pope's ex 4-CEP TSO 70273 (once part of SR EMU unit 1530) which is now in the C&W shed at Meldon being prepared for next year's services. The roof has been cleared of the old loose and flaking coating ready for the application of a coating of bitumen paint. At the same time preparatory work clearing the under frames of rust and applying a coat of anti corrosion primer has started. Ex 4-CEP TSO 70273 - once part of SR EMU unit 1530. 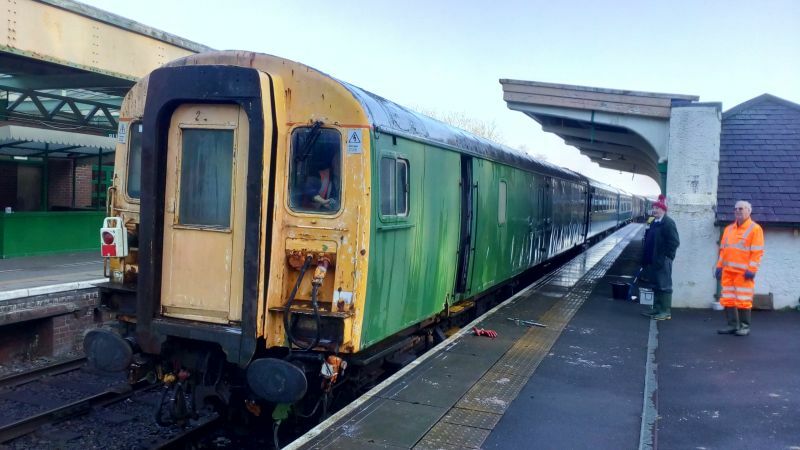 The third picture shows DRSA member Peter Spokes' ex Class 423/2 4-VOP driving trailer 76398 (SR EMU unit 3905 and part of the only 4-VOP unit in preservation) waiting to come into the shed. If all goes according to plan this vehicle will, after refurbishment, also form part of next year's trains. Ex Class 423/2 4-VOP driving trailer 76398 - once part of SR EMU unit 3905. 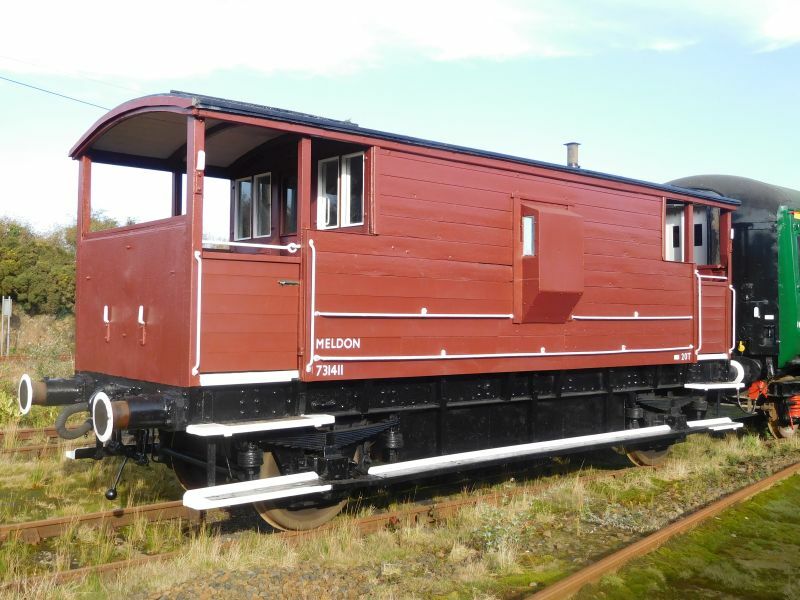 The remaining 3 photos feature some of the rolling stock to be found in the Meldon yard. DRSA owned FK S13436 in the autumn sunshine at Meldon. Three quarters of the DRSA's fleet forming the 'vacuum rake': ex LMS Goods Brake Van now looking very tidy, FK S13436 and Lab11 at Meldon. Nothing to do with DRSA's C&W team, but this is the new Polar Express livery. The ex-LMS brake 713411 is being finished off, the second pair of veranda gates having been made and painted. Some last minute problems with the door lock mechanisms on Mk2A FK coach 13436 are proving difficult to put right but are gradually being dealt with. Julian Pope's ex 4-CEP EMU TSO 70273, earmarked for inclusion in next years '08' hauled air-braked set, is now in the shed and work has started on its refurbishment with about 50% of the of the loose flaking roof coating removed. 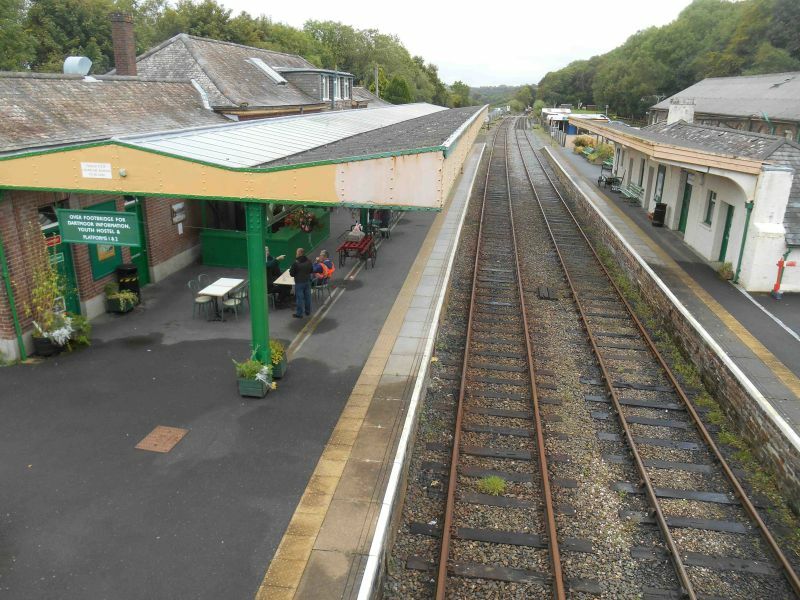 For the last few weeks, work by the now rather diminished SMT has centred on preparing the 2 rooms on Okehampton's platform 2 which DRSA now leases. 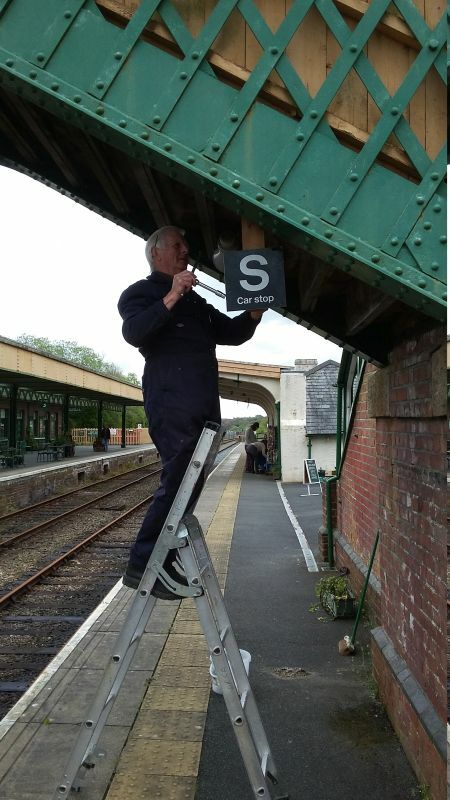 Apart from some of the external woodwork, they have now been repainted, thanks to a solo effort from our painting machine Geoff Brookes, taking a break from the endless Okehampton footbridge repaint. Tom Baxter and Jon Kelsey made a meal of changing the locks but got there in the end. Quite a lot of second hand books and other odds and ends have arrived, and we await instructions from the 'shop committee' before proceeding further. 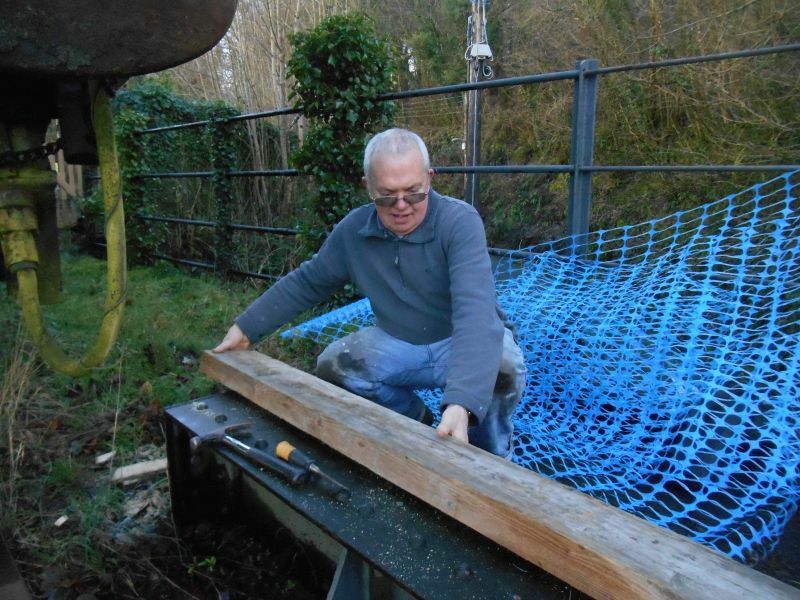 We're grateful to Dave Trant, who attended Mary's farewell barbecue last week and just happened to bring his welder (as you do) which he put to good effect repairing the Okehampton footbridge handrails. Yesterday Tom Baxter cleaned up some of the paintwork, and pondered some strange effects at what the bridge's Victorian builders would no doubt have called the handrail/brickwork interface. 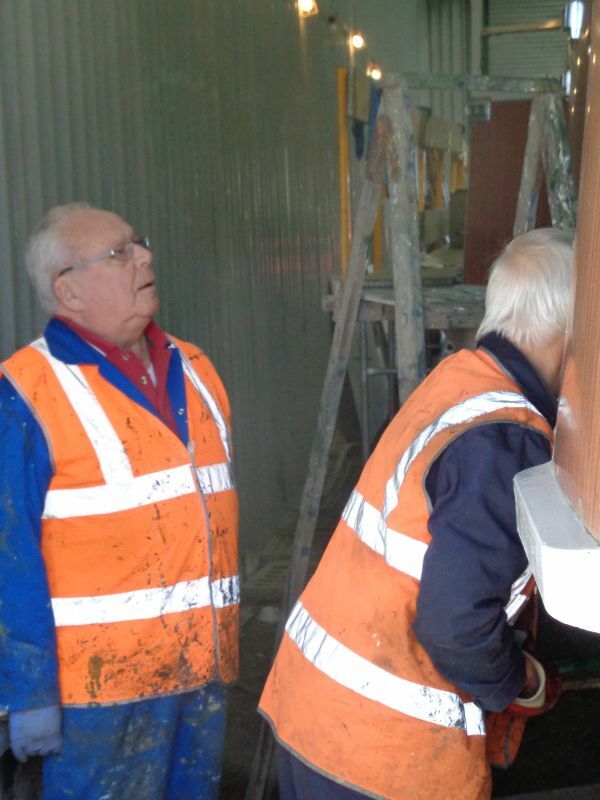 Flushed with the success of the Meldon Viaduct running in board, John Coxon and Jon Kelsey are now building a new frame for the Okehampton board, whose rotten wood featured embarrassingly in press photographs of August's museum reopening. The frame members have been cut, and the Brookes machine primed and undercoated them yesterday. After the excitement of the preparation for last week's museum reopening it was back to the mundane stuff. John Coxon, Tom Baxter and (eventually) Jon Kelsey turned out and repaired guttering, measured up the Okehampton running in board for future refurbishment, and unblocked drains. This railway heritage work is heady stuff. DRSA's hydrodynamic response team of John Coxon and Tom Baxter redirecting guttering to prevent damp getting into the Platform 2 disabled toilet. 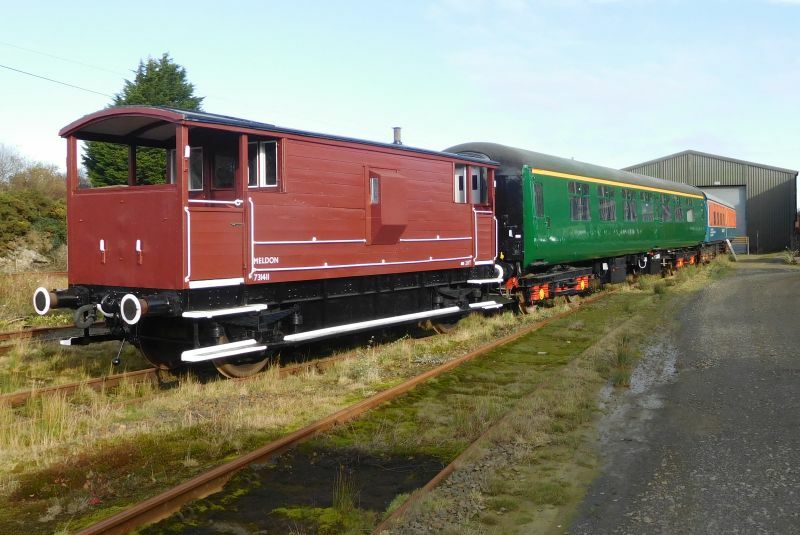 In order to enable GLL to offer brake van rides the C&W team has been refurbishing the DRSA owned 1942 ex-LMS brake van 731411. Initially this was expected to be no more than the fitting of safety gates to the East end veranda, and a freshen up of the internal and external paintwork where necessary. However the discovery of previously undetected areas of rusting and rotting has meant that all the floor timbers to the West end veranda have had to be replaced along with some sections of the external panelling. With the additional repainting this necessitated, the job has taken about 3 1/2 months instead of the 3 - 4 weeks originally planned. This just goes to show that you never know what will be found when working on vehicles which are over 70 years old. Floor frames exposed. John Coxon, Pat Lennon and Dave Clegg in evidence. Work in progress. New recruit John Davis being supervised by Dave Clegg. It's pleasing to report an influx of new volunteers recently. Joe Hawkins has joined the ticket office, fitting in nicely and seeming to enjoy the experience. More recently, John Davis joined the Carriage and Wagon team on Thursdays at Meldon. Yesterday, locals Alan and Maureen Harris came along for the first time. Maureen brings retail and admin experience and made a start in the ticket office, whilst Alan joined in with the SMT work and was still painting Okehampton footbridge when the rest of the team went home. Welcome to all of you. The splendid floral displays at Okehampton station are the work of DRSA's horticulture team of Ann Rochester, Mavis Goff and Sue Baxter, who can be found hard at work most Saturdays. Here are couple of recent pictures of their work. The team of 4 volunteers, Sue Baxter, John Wills, Peter Wills and Andrew Turner was out and about with the 2 professionals, Alan Cocker and Andy Webb. The location was around mile 191 before North Tawton viaduct and there was an inquisitive audience looking down on the hard workers. A decent area on both sides of the track was cleared, but there is so much more to do. The cows enjoyed the show and it was another enjoyable day out. Andrew Turner's pictures give a nice idea of the team's activities. John and Peter Wills, with audience. Unseasonable weather and the prospect of trains running soon brought a couple more team members out of hibernation. 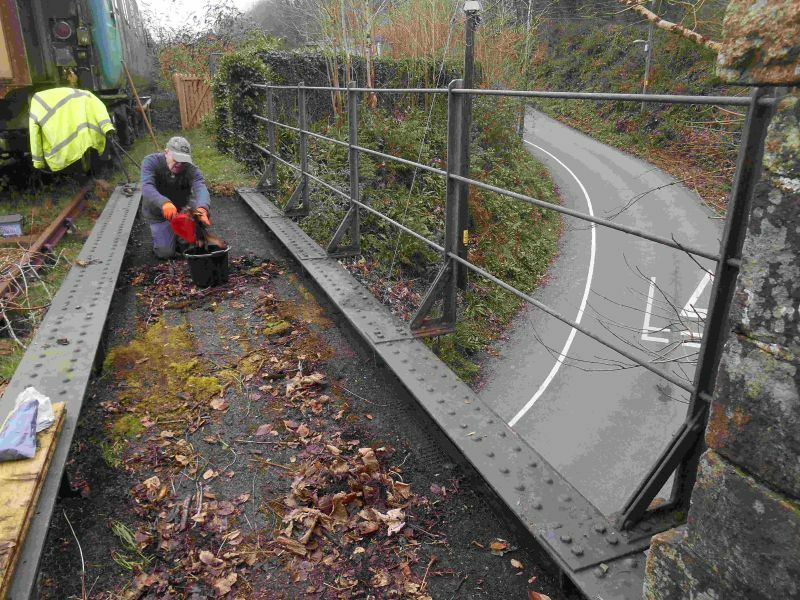 Whilst Geoff Brookes remained at Okehampton painting the footbridge, Mark Williams, John Caesar, Tom Baxter and Jon Kelsey headed to Meldon. Mark and John helped John Coxon prepare Lab 11 for service in a few weeks time, whilst Tom and Jon worked on various station signs. On return to Okehampton we were met by Simon Jeffery delivering the next 7 of his excellent replica bridge plates. Grateful thanks are due to John Coxon and Andy Turner for becoming honorary members of the SMT for the day, and helping PM and JK. Tasks for the day were a tad mundane, involving some post-PE repairs and tidying up in the Okehampton buffet, in preparation for its re-opening on January 9th.